The most versatile alpine boot! "Nebulous" - a new route on the NW face of Malte Brun. 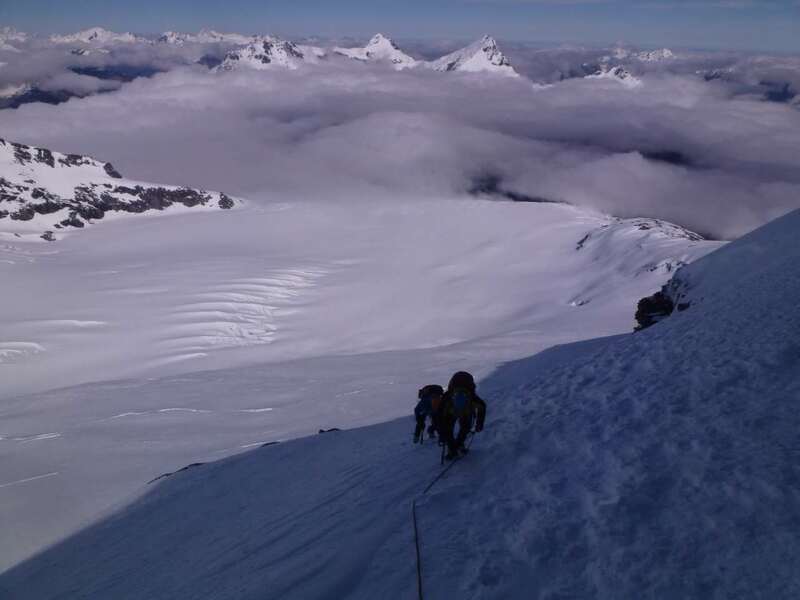 Chris, Joe and Geoff completed the 18 - 20 pitch route from the Bonney glacier to the summit of Malte Brun in 12 hours. The original intention was to locate the Tom Fyfe 1st ascent route of 1894. Half a metre of new snow, obscure route finding and a few serious of crux pitches left us very curious about our respective route locations? 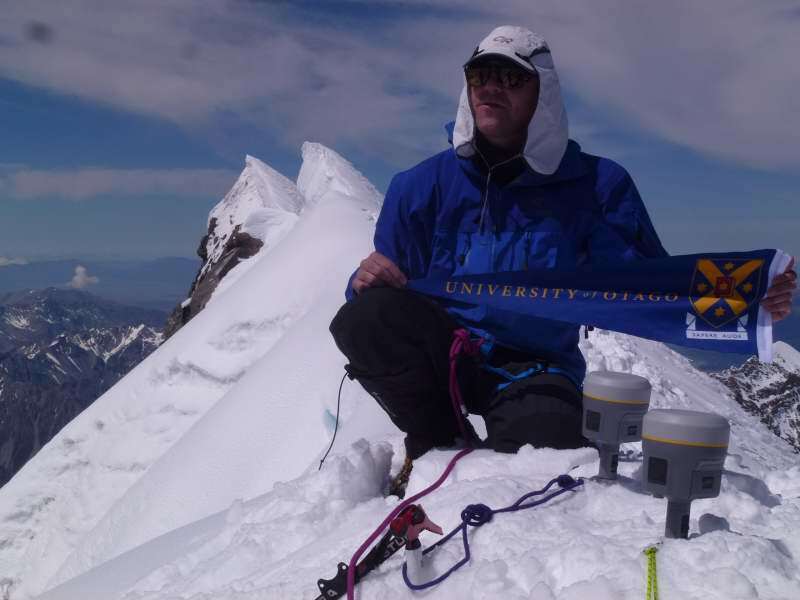 "Nebulous - A Homage to Tom Fyfe"
On 23 Nov 2013, a Survey Team from Otago University led by Dr Nicholas Cullen and guided by Geoff W and Brian W climbed to the summit to confirm its new height. 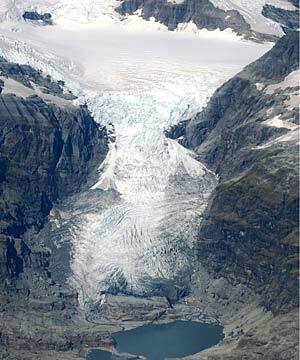 Dr. Sirguey, the project leader for the research, says that the discrepancy between the old height (estimated from aerial photography immediately following a massive rock-ice collapse on 14 December 1991) and the new height can be explained by a two-decades-long reshaping process affecting the remnant of the originally thick ice cap. 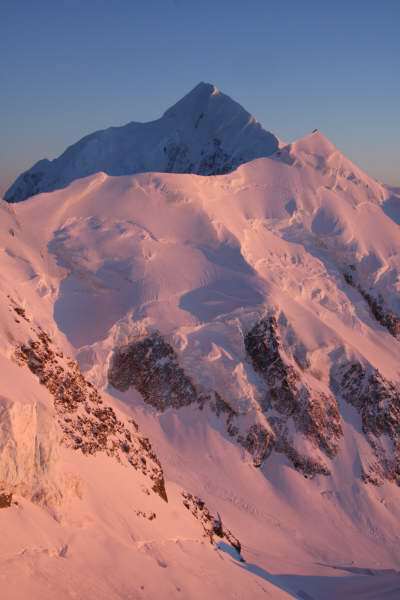 Despite being taken down a peg or two, Aoraki/Mt Cook still towers above its close neighbour Rarakiroa/Mount Tasman, which with its current official height of 3497m, remains the second highest mountain in New Zealand. 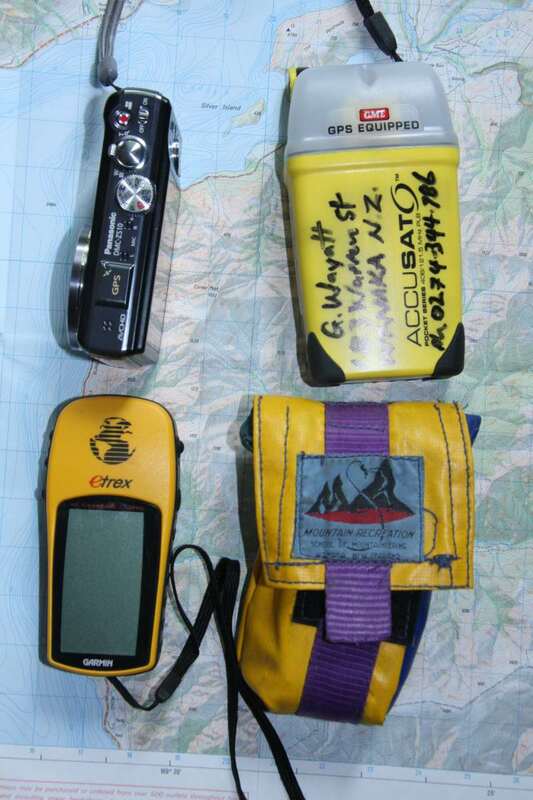 The new GPS measurement is only the sixth non-aerial accurate survey of the mountain’s height ever to be taken, with the previous trigonometric measurements made in 1851, 1879, 1881, 1883 and 1889, says Dr Sirguey. 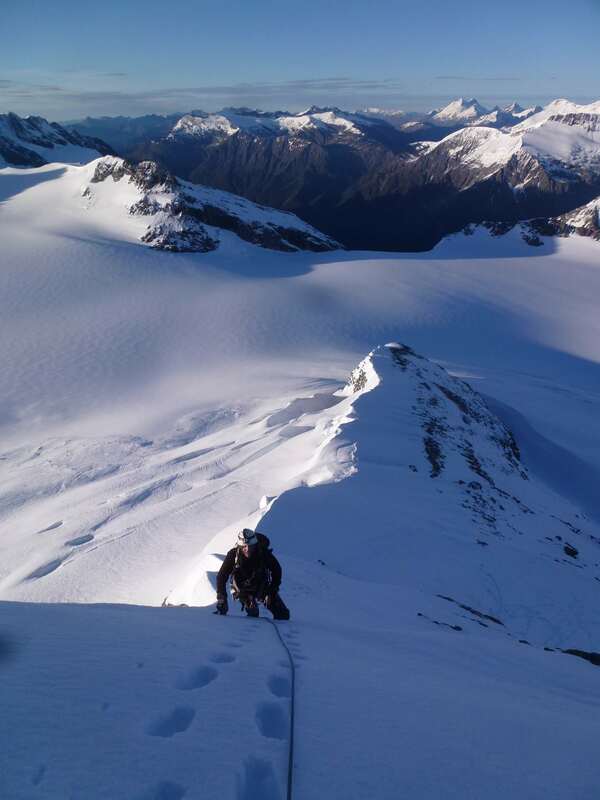 In near perfect condition Geoff & Ian H. completed a 9hr climb from a Bonar Glacier Bivi. The pair then descended down to Shovel Flat by 10p.m. in front of a rain forecast. January 2013: "Czech-mate" A 5 day Aspiring circuit with Chris M.
February 2013 – Aspiring Treks: Spectacular valley & mtn views. 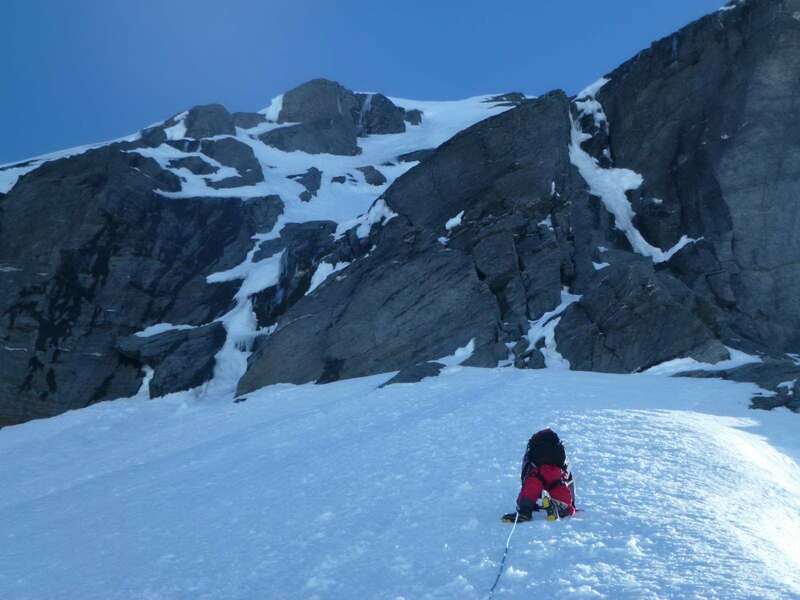 June: The continued occurrence of fatalities on Cascade Saddle prompts GW involvement in reviewing possible solutions to inexperienced trampers attempting the crossing when snow covered without robust boots and alpine equipment. July: Motatupu Rescue leaders: Rich R, Milo G. and Geoff W receive Humane Society cert. 14 Dec - Mountaineer, Mt. 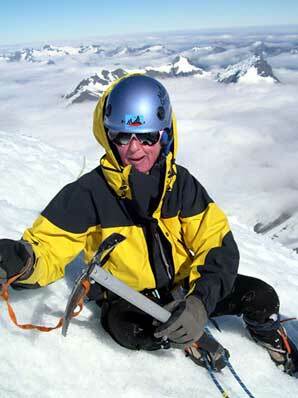 Cook Private Guiding Founder & Outward Bound Warden, Don McKay (84) passed away on 13 Dec. 2013. Close family friends Mike & Jean Nelson, received news yesterday that their long-time friend of sixty years, was found deceased in the water near his yacht anchored at Durville Island yesterday. It is presumed that Don suffered a heart attack and fell over-board. 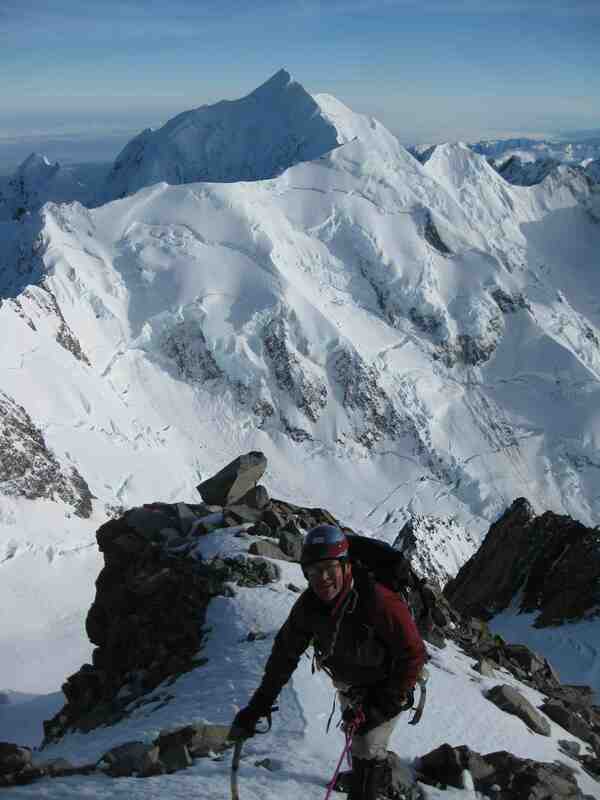 Don was an outstanding mountaineering Instructor (Alpine Instruction, Mt. Cook) and Outward Bound Warden from 1967-74). 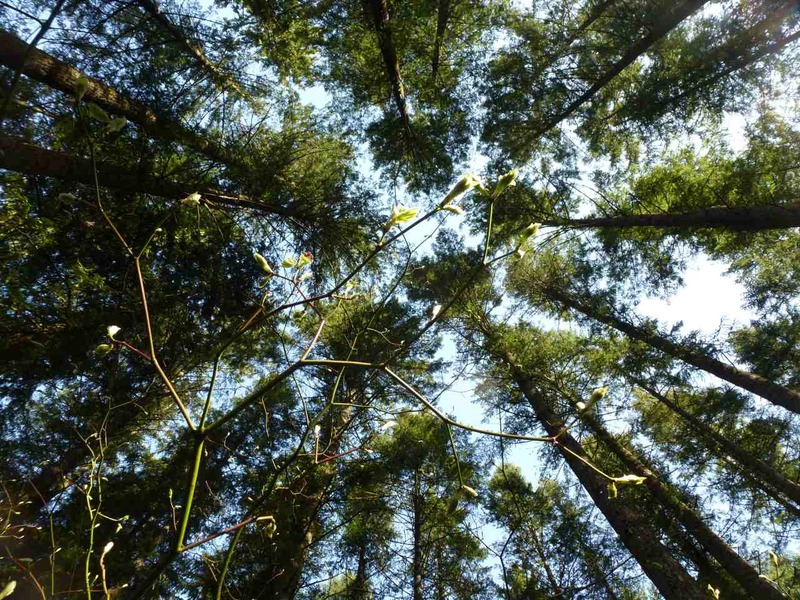 He had trained in Forestry at Lincoln College and returned to this work in mid-life. In recent years, Don resided on his yacht in the Marlborough Sounds. 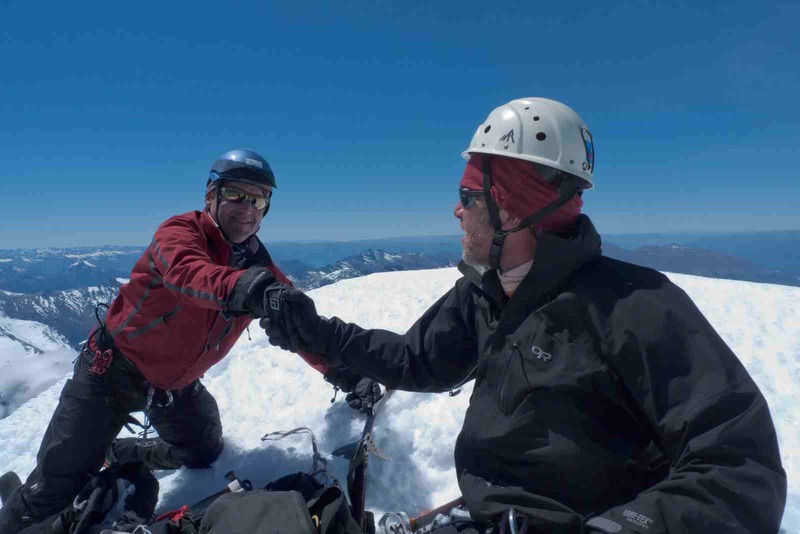 Geoff W. remembers Don as his 1st climbing Instructor at Mt. Cook in Dec. 1965. 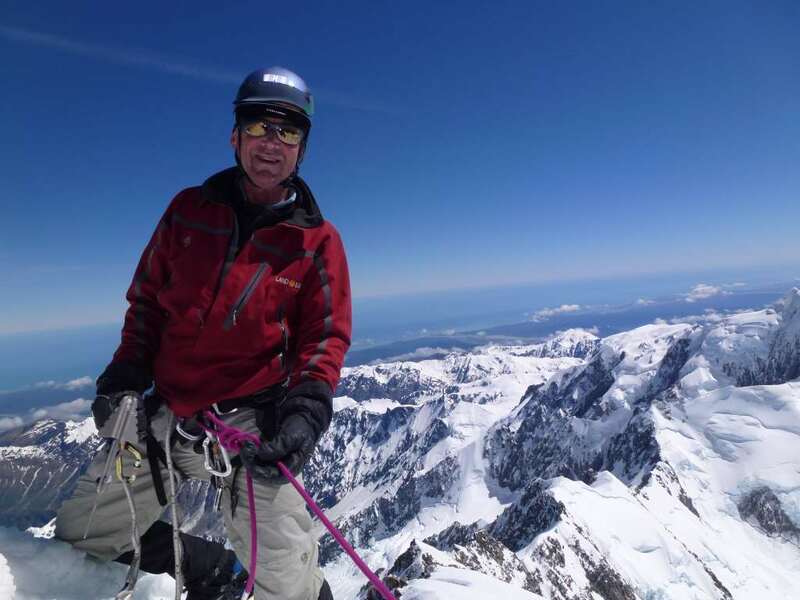 Don had just formed the 1st private Climbing Instruction & Guiding Company at Mt. Cook with Lynn Crawford and Pete Farrell - Alpine Instruction, later to be re-named Alpine Guides. 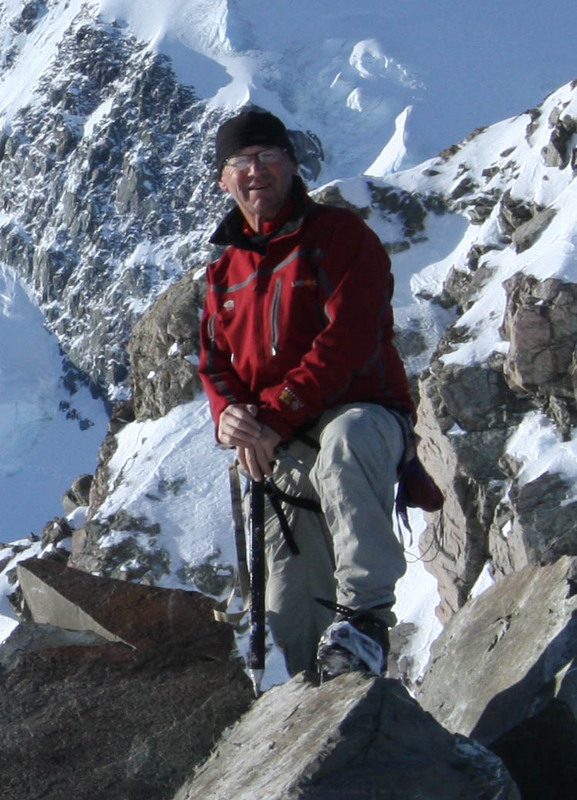 "I re-call Don was an inspirational Instructor with providing students with clear technical information embedded in a mountain context." They were amongst the best mountaineers in NZ at the time. It was difficult for the embryo Company to support 3 Principals, so Don moved onto Outward Bound. Pete maintained his electrical work. They brought in Bruce Jenkinson to head the instruction & guiding, then later Lynn re-linked the Company with the Tourist Hotel Corp. at the Hermitage. 11 Dec - Mountain Wardrobe Mal-function? 02 Dec: Santa's sleigh broke? GW w/Groomer left on Tasman Glacier from 70's skiplane run-way work at Climbers Col. Since being abandoned it's moved about 5klm. in 30 years down to Malte Brun. 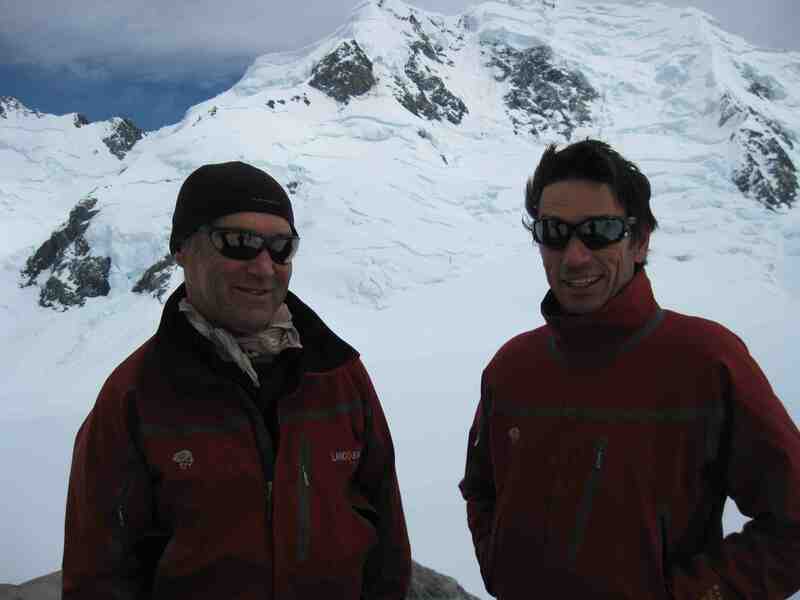 A 2 day weather window enabled enable Geoff W and Brian Weedon to lead an Otago University team (2) to Mt. Cook, summating at 11am on Sat 23rd Nov. (Geoff's 27th ascent). Brian leads steep 1st gully from the Linda Ice Shelf to Summit Rocks. 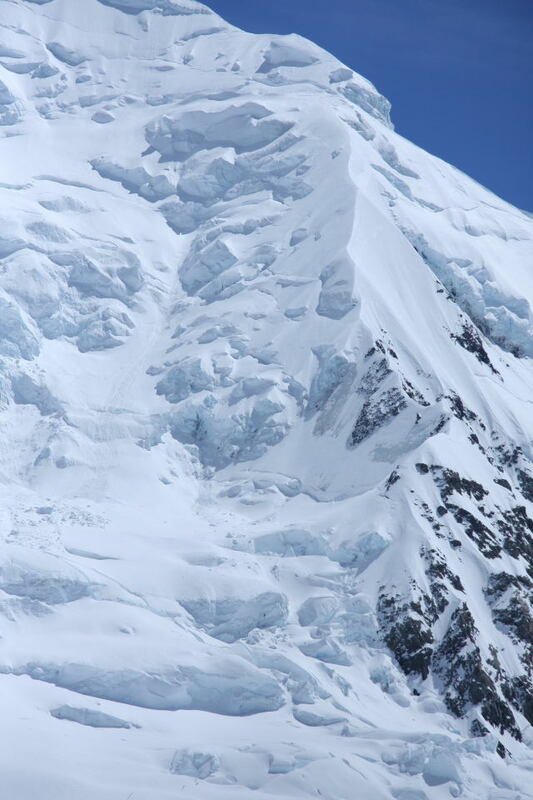 At 12.20pm a size 4 Ice Serac avalanche (100,000tonnes?) swept through the Upper Linda glacier filling the "problem?" schrund to the delight? of climbers desiring access onto the peak. Close encounters with large avalanches is a terrifying experience. My ski poles and spare waterbottle were left for convenience at the schund for 8hrs and are now buried! 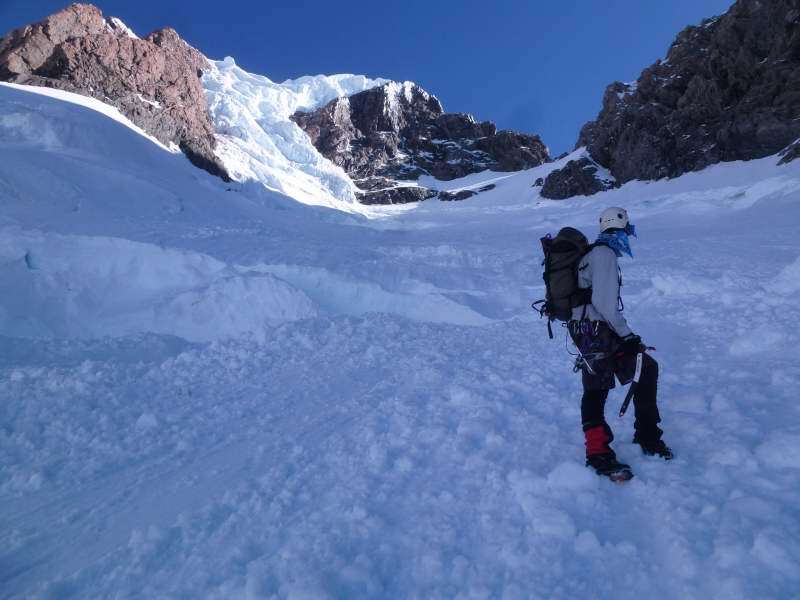 The risk to climbers from large avalanches? One of the Mt. Cook SAR team recalled to me yesterday, that 2 of them were traversing under the Empress Ice Shelf on the West side of Cook earlier this week, when at 3am in the darkness a huge roar started above them. For a few terrifying minutes they expected to become engulfed in an icy torrent. Luckily it swept behind them. 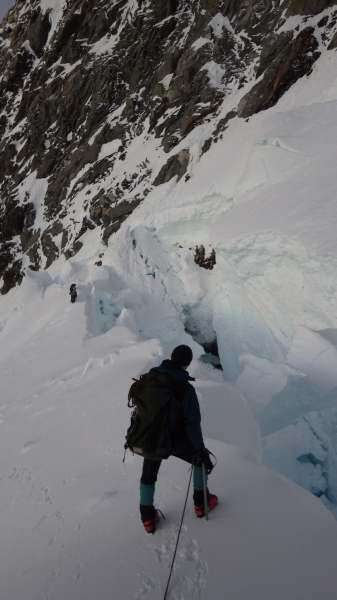 The probability of climber involvement in a large avalanche event is dependent several factors including the length of exposure, frequency of avalanches and traffic. 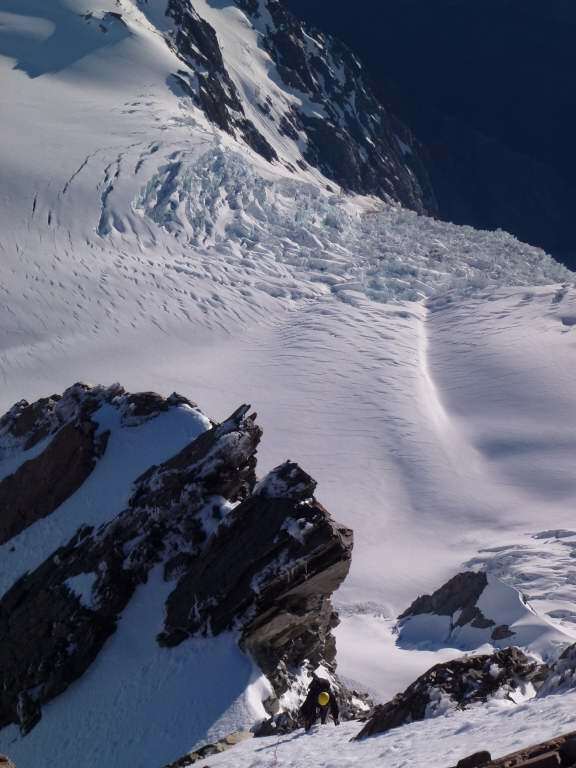 Ice Serac or Rockfall failure can happen at any time of the day, but may be influenced by precipitation, lubrication and temperature changes. Last summer's Mt. 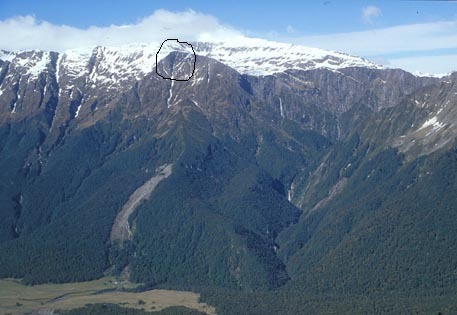 Dixon rockfall avalanche (see below)swept through the Grand Plateau narrowly missing the Plateau hut. Inspite of the intimidating series of ice serac paths from the Gun-barrels, North Face/Mt. 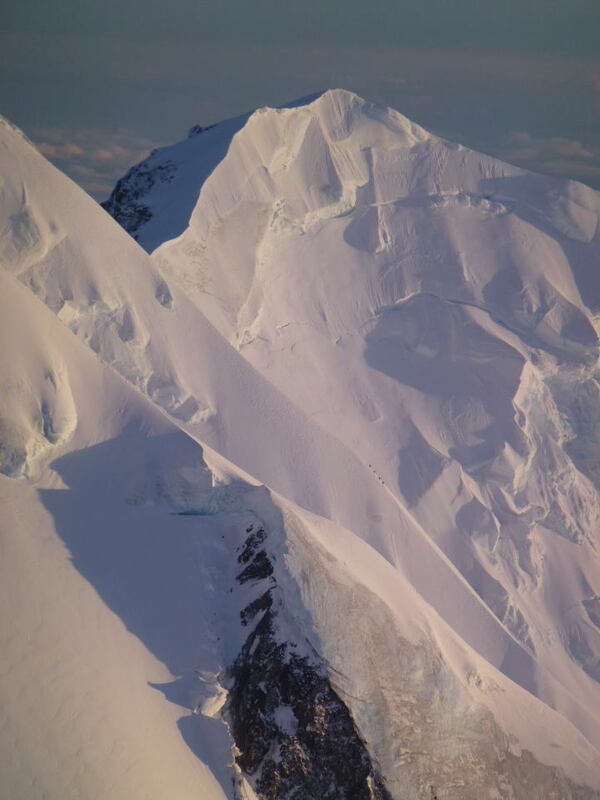 Cook, the Ice Shelf cliffs, Vancouver and Tiechelman corner, the longest path is in the lower Linda where cliffs on Graham and Silberhorn sweep snow out into the Grand Plateau. 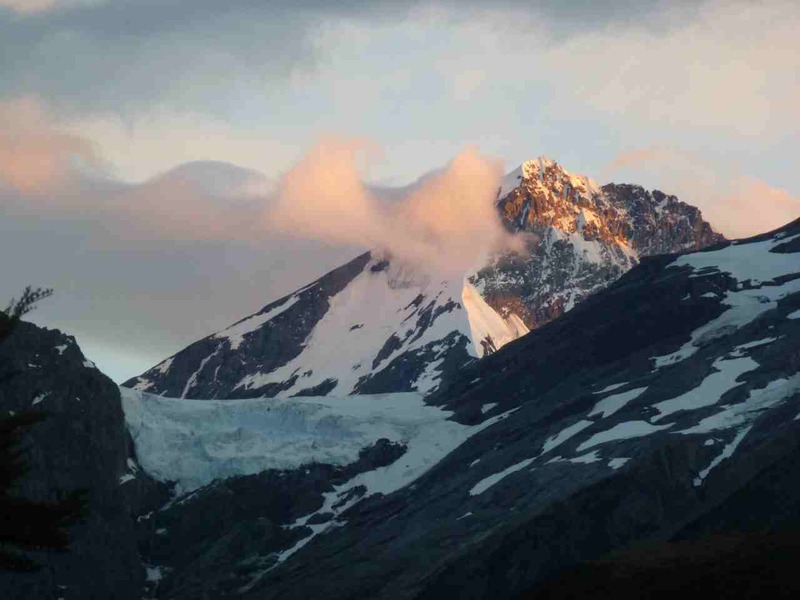 There may have been about 6 climbers caught by avalanches in the Linda glacier in the past 100 years. 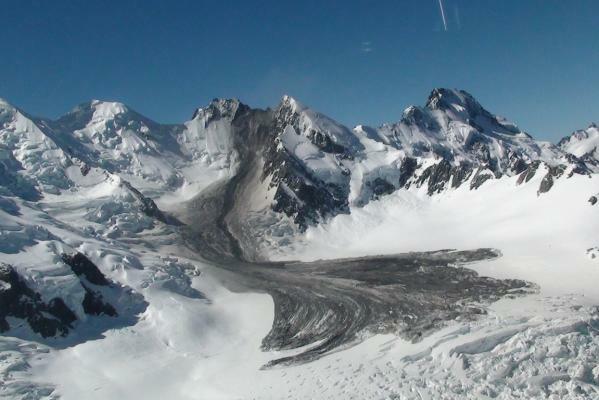 The 1st three fatalities occurred in 1914 when an avalanche off Mt. Vancouver buried King, Richmond and Thompson. 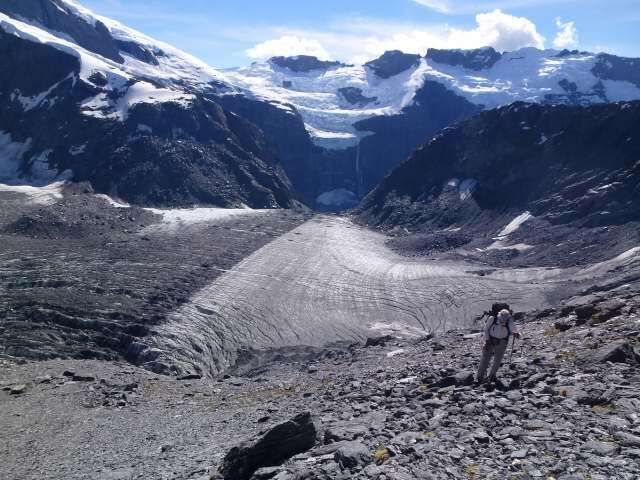 Probably over 200 people travel through the glacier each season puts the risk level into a low-moderate risk perspective. 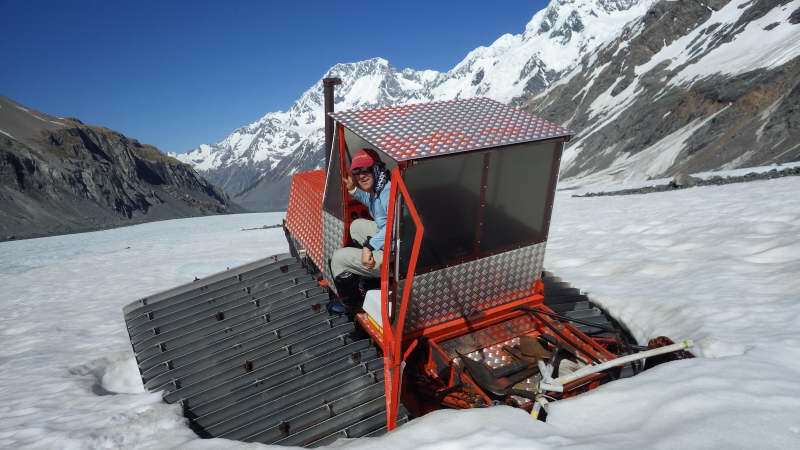 "It's not the large avalanche isolated avalanche I worry about, but the one I trigger myself !" 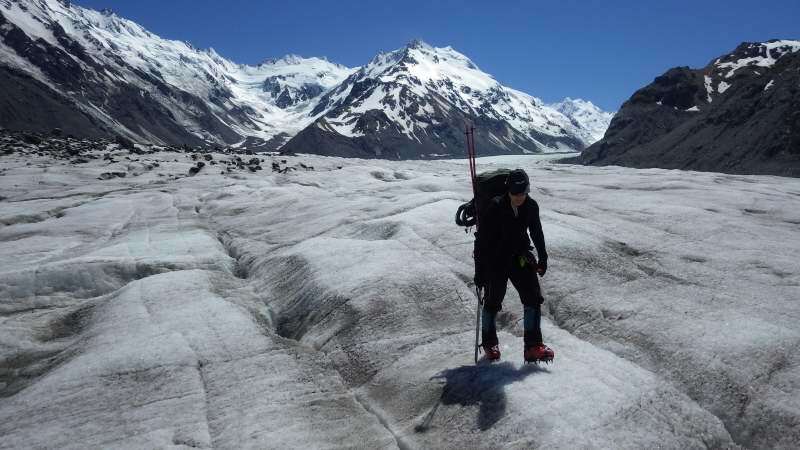 "A Christchurch mountaineer who fell 300m down the Cameron Glacier in the Arrowsmith Range has woken up from her coma. Heather Rhodes, 36, was taken to hospital after she fell last Sunday, with serious head injuries and two broken legs. She has been in the intensive care unit since then. She woke up yesterday, said a family member who asked not to be named, and apparently the first thing she said was that she wanted her mother. She was in a critical but stable condition. " Heather Rhodes, a experienced Canterbury climber fell 300m when an abseil anchor failed on a climb in the Arrowsmiths on Sunday 03 Nov.
Heather sustained serious head and leg injuries and evacuated in a difficult night-time rescue by her 2 companions and Rescue helicopter with NVG capability. Geoff W has met Heather on a couple of occasions, most recently at Mt. Cook Airport 12mths ago, when both were leaving on separate ski-mountaineering trips. We discussed her recent ascent of Avalanche peak with her Dad with fondness. I wish her and family well in this difficult and tenuous time as Heather struggles to overcome the life threatening injuries. Critically-injured mountaineer Heather Rhodes is in a coma at Christchurch Hospital after a South Island climbing accident. John Rhodes, her Greytown-based father, said his daughter had been unconscious since her fall. ''It is really just an unknown quantity. Her body has various injuries - particularly a very damaged leg, and there is a head injury. We do not have a good understanding of how serious it is,'' he said. He said he and his wife were both keen trampers and introduced their children to the outdoors at an early age. "Heather has certainly taken tramping to another level." 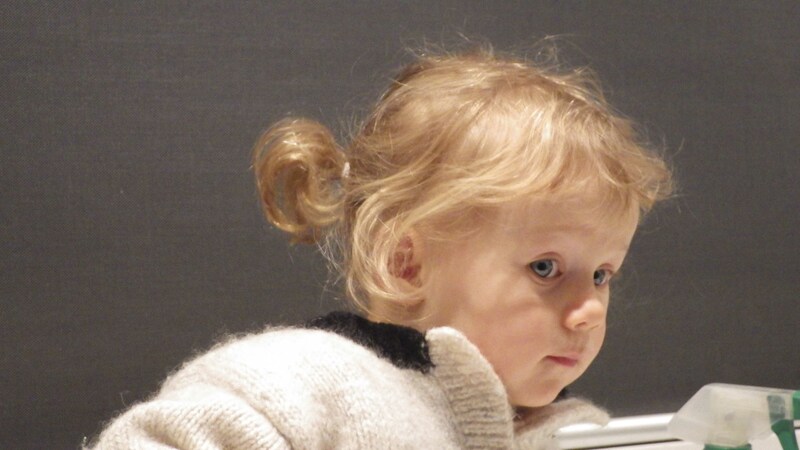 His daughter had no partner or children, but ''heaps'' of friends. He had been charged with keeping everyone updated on her condition. Rhodes, who last worked as an instructor for the army leadership centre based at Burnham Military Camp, was climbing with two other companions - Vaughan Snowdon and Simon Bell. A spokesman for Westpac Rescue Helicopter told The Press the trio were descending at the time of the accident. 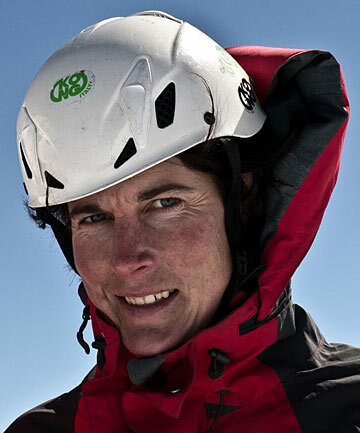 It was about 6.30pm and Rhodes' companions believed her snow anchor failed while she was abseiling down a steep pitch. They saw her fall past them and found her unconscious and badly injured below, after down-climbing to her without ropes. They activated a personal locator beacon and placed her in a tent to keep her warm while waiting for help. 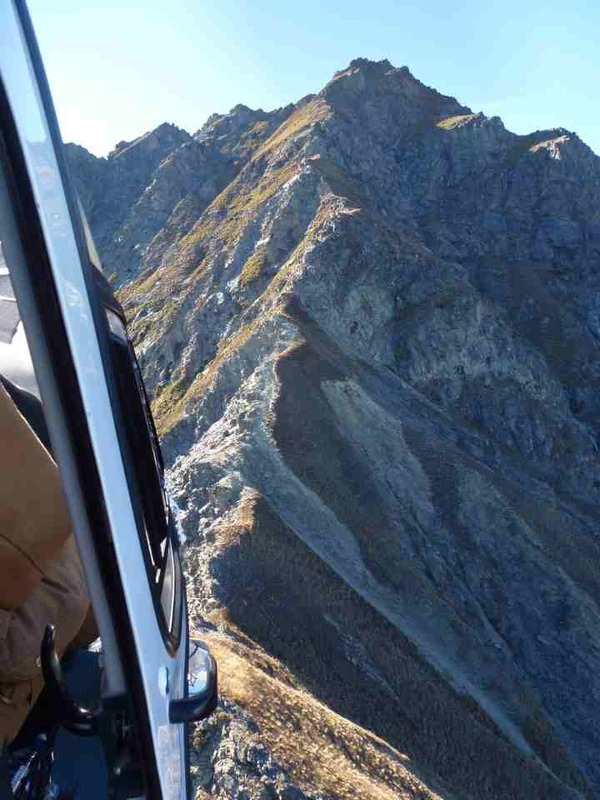 The Rescue Coordination Centre New Zealand (RCCNZ) picked up the beacon's signal that night and called in the rescue helicopter with their approximate location in the upper reaches of the Rakaia River. 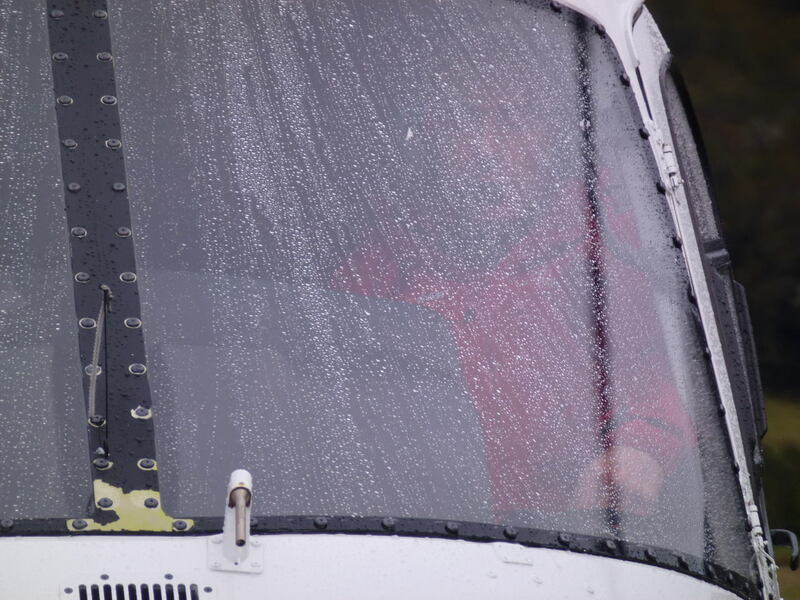 Both the pilot and one of the two paramedics on board were armed with night goggles, finally spotting the beacon's strobe andthe climbers' head torches about 10.45pm. 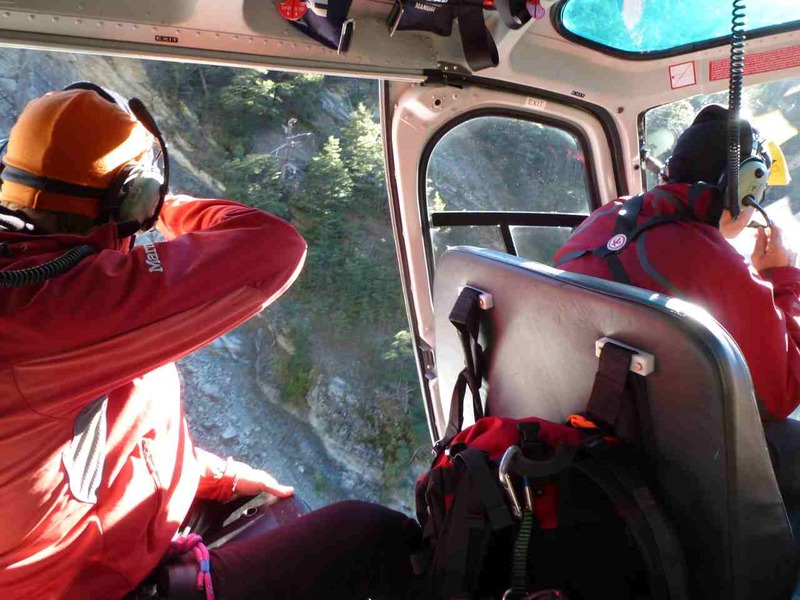 Conditions proved too dangerous to winch the woman to safety because of the steep and unknown terrain. They were forced to land on the opposite side of the glacier instead. 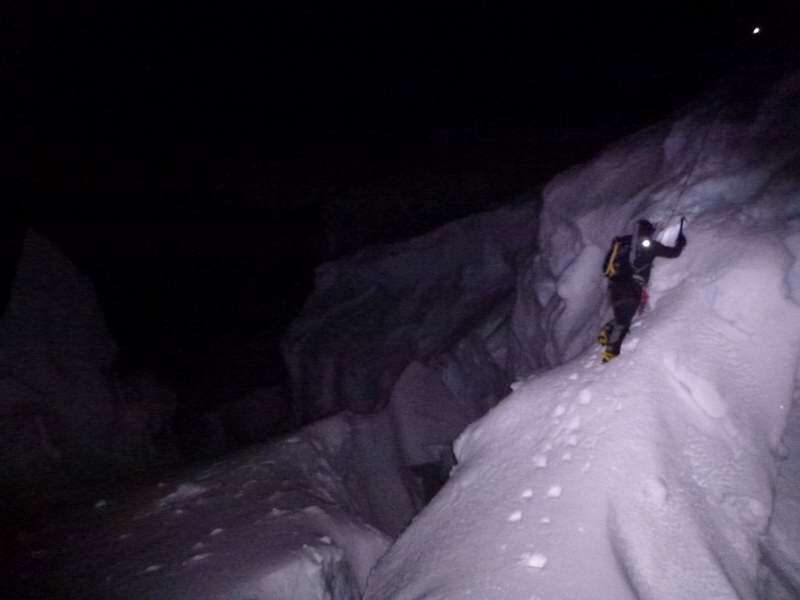 One of the climbers met the chopper, before guiding the paramedics about 40 minutes in darkness across deep snow and ice to Rhodes. On October 9, 2013 at 05.30 am we started. Dan Patitucci and Jonah, Don Bowie and I. We moved to the foot of the face. Dan Patitucci and Jonah are responsible for the pictures. Finally all just fit. The weather was ok, but the wind was quite strong. Don Bowie, my parnter, decided at the Bergschrund not enter the face. He said that it was technically too demanding to climb the face without rope. And this is the basic premise for such a route. From the Bergschrund I climbed alone. At the first moment it was difficult for me to switch on soloing. But the good conditions helped me to quickly get focussed on the climbing. Once more everything just fit. At 6100 meters we had placed some equipment. The weeks before we had acclimatized ourselves in the face and we had placed rope, tent, cooker and something to eat up there. I packed the tent and the cooker in my backpack. The rope I left there, since I had a 6mm reep rope with me, which I took with me from the ABC. I left the sleeping bag because of weight reasons together wit gas and food an existing rope and fixed it at a hook. The ascent to the headwall was relatively easy. From 6600 meters on I had wind and spindrifts. I climb until below the headwall. Here I wanted to build my tent and wait. I had different possibilities: To wait until the wind got less and I could continue to climb or I would descend the day after. Since I did not find a protected place I started to descend. 100 meters below I found a crevice. 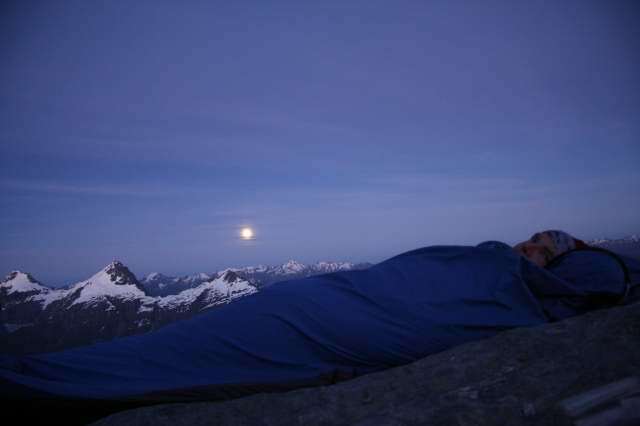 It turned out to be a perfect bivouac place and I could place my tent sheltered from wind and spindrifts. Now I ate and drunk a lot. In the meantime the sun had gone. And everything calmed down. This I noticed also the evening before from ABC. And it was again exactly the same. Fast it darkened and it was calm. This was my chance. I was sure that the following day the wind would turn on again. So this was my only chance to reach the summit during the night. 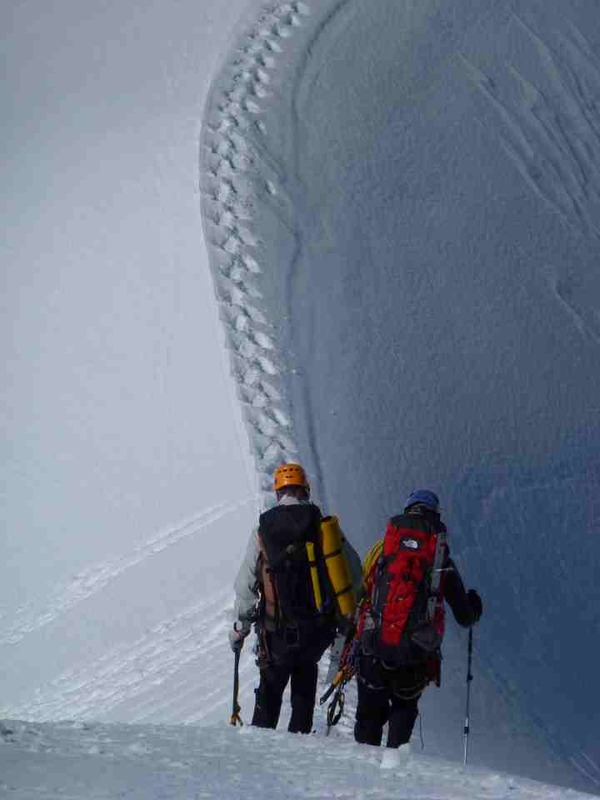 The headwall was a line of ice and firn. So it would be possible to the way in the night. Approx. one hour after I reached the bivouac I continued my climbing. During short passages the ice/firn was quite thin and a couple of times I had to climb in the rock. 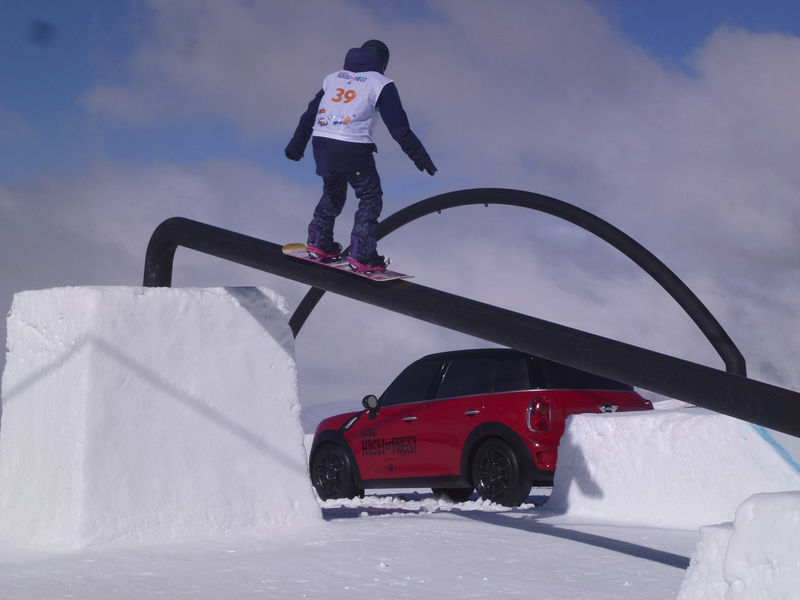 The steepness was surprisingly not really vertical, only a couple of uplifts were vertical. So it was the ideal solo terrain. As long as I could climb I was extremely efficient. This I had in my mind all the time. The thin air at 7000 meters is not yet death zone. At this height I could move quite easily. Only the cold was a problem. A couple of hours before at daylight I wanted to photograph the headwall in order to have an overview picture at night. A was hidden by a spindrift. I could only get grasp my ice gear in order not get knocked out of the wall. In this way I lost one of my down glove and my camera was thrown out of the wall. Now I had to climb with my finger gloves. The down glove which was left I wore once at my left hand and then at my right hand - depending on the cold of each hand. The headwall presented itself shorter that I thought. Difficult to say how many pitches, since I did not use the rope. Instinctively I was at the upper end quite fast. Here I realized for the first time, where I really was and what this would mean. Now I was just a beat against the wind. Step by step I moved on. I kept telling me "Just fight, just fight". Again and again. When I reached the summit ridge I could hardly believe it. It was night, the sky full of stars and the ridge going down in front of me. With my altimeter I checked everything very carefully, I followed the ridge and I knew: I was on highest point. I spent not even 5 minutes up there before I started to descend. I was still full under tension. My goal was to reach the Bergschrund. Then everything would be fine! Tenji, Don and Dan meet me at the glacier. They had followed me the entire time while I was climbing. Now they came towards me. Tenji had a Coke, bread and an apple for me. It is simply great. I made it. Everything is over now. From now the others make the decisions. The tension get less. On October 10, 2013 at 09.30 am we all are back at base camp. The docu/movie about Ed Hillary's build-up to the 1953 Everest 1st ascent is now in the movie houses. It's a well put together NZ film by Leanne Poole and makes good use of Ed's voice and other Everesters. Highlights? 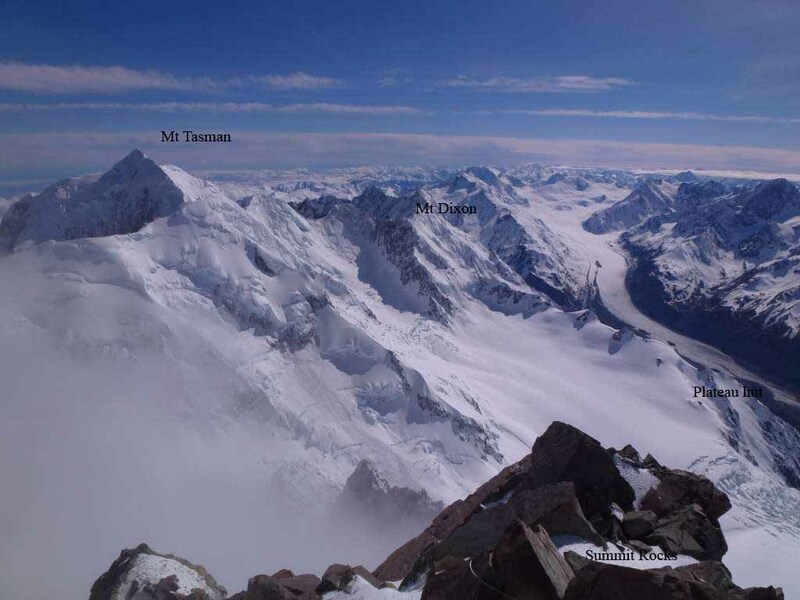 Original ascent footage use; the 360deg view from the Summit and familiar backdrops in the Tasman Glacier. Antarctic Epic re-visited in new book? News that Mawson may have eaten more than dog would come as no surprise to the Arctic Inuits and be considered a non-event. In fact the dogs which were shot were completed stuffed and would have had little nutritional value. More interestingly, Mawson ate their livers and got Vit. A poisioning resulting in the soles of his feet peeling off! Ask any Teen with achne about ro-acutane and it's skin peeling effect. 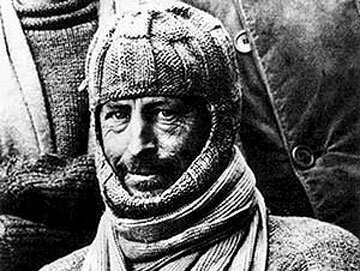 Australia's polar hero, Douglas Mawson, survived an epic Antarctic ordeal after he deliberately starved his surviving companion to death and possibly ate him, a new book suggests. Mawson's defining feat was to survive a 560-kilometre ice trek in 1912-13 that killed his two fellow explorers, Belgrave Ninnis, who fell into a crevasse with much of their food and equipment, and Xavier Mertz, who died in the struggle to get back to home camp. The man who was pictured on the first $100 note may have calculated there was insufficient food left for both him and Mertz to reach their base after the loss of Ninnis, Melbourne-based historian David Day says. Day suggests that Mawson put himself and Mertz on starvation rations, calculating his companion would succumb first, and leaving Mawson with enough food to make it back. Day's book Flaws in the Ice also says that a weakened Mawson may have boiled and eaten Mertz's flesh to gain strength. The South Australian Museum's senior collections manager, Mark Pharaoh, said competitive starvation would have been a strange strategy for Mawson. "It seems a little illogical and dangerous," Pharaoh said. "Mertz was a phenomenally tough character. One doesn't know if you are going to be the winner." ANU history professor Tom Griffiths said Day's claim amounted to unwarranted speculation. "Mawson actually dragged Mertz on a sled until it was too painful to carry on." 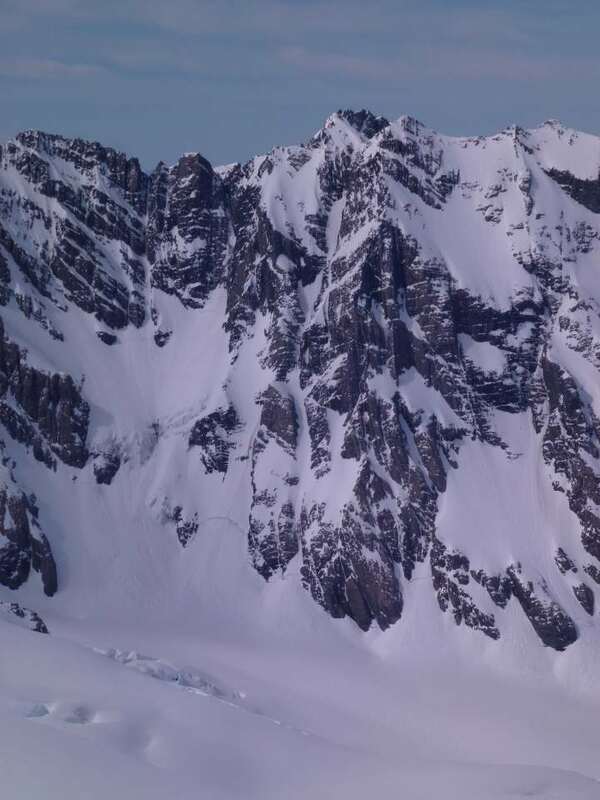 The Utah Avalanche Center, run by Bruce Tremper, is a great source of current avalanche information and discussion. Check out their Blog on Air-Bag survival statistics. The bags are effective tools, but the survival statistics used by various sources overstate their value. 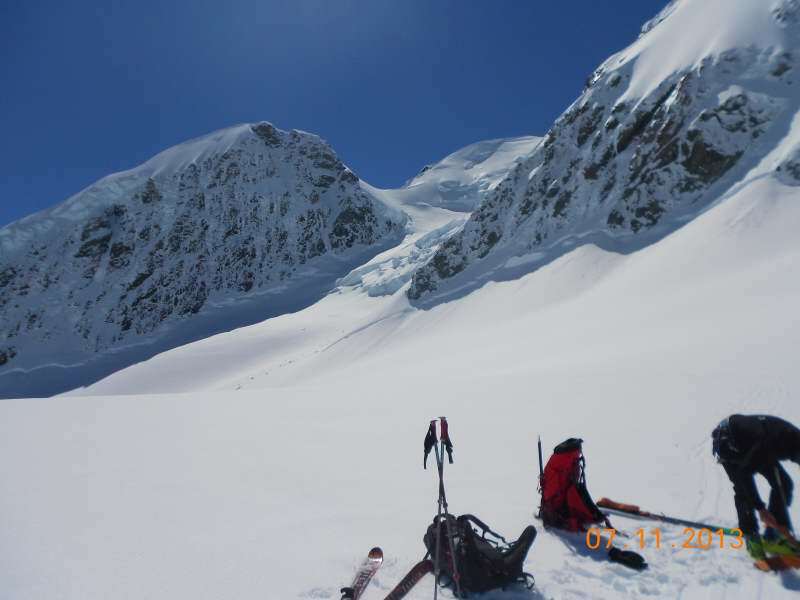 Bruce discusses survival and non-survivable avalanche terrain and protection device use. 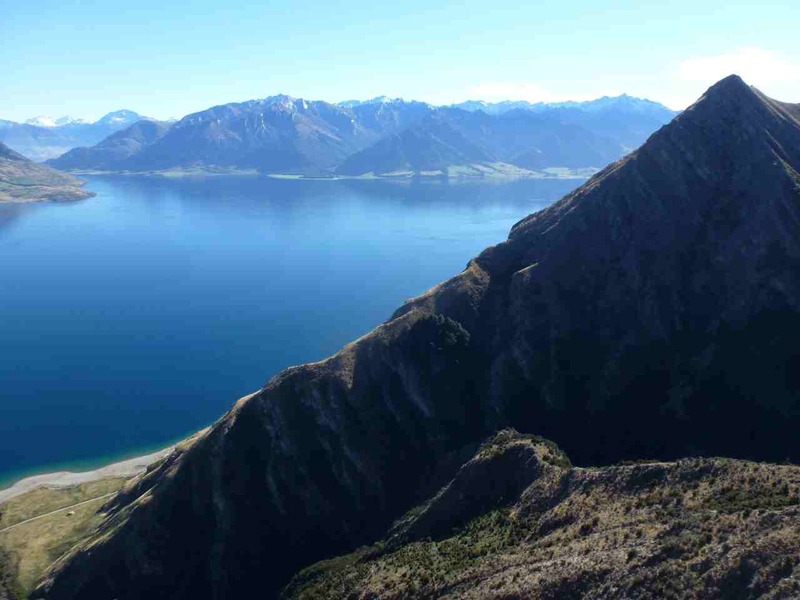 Two Euro Paragliders are currently attempting to fly and walk the length of the Sthn Alps from Mavora Lakes to Nelson. 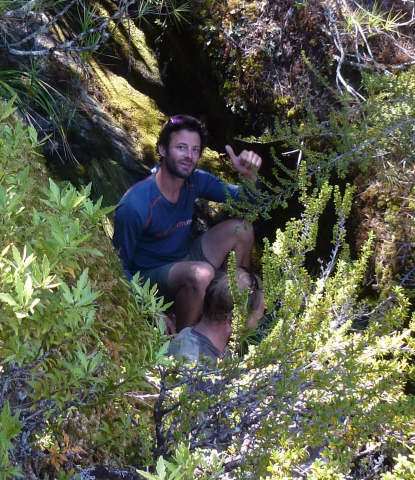 Geoff W and Chris M met Tom de Dorlodot, a 27yr old Belgium and Ferdinand Van Schelven (28, Netherlands) on 29 Jan. at tree-line in the E. Matuki resting in a shady creek and looking for a thermal to take them Nth. down the Albertburn towards Makarora. Towards the end of our own 4 day/3 Glacier/U.V Expedition, we were spell-bound to chat briefly to two adventurers intent on riding air-currents linked by extended and serious walking to gain suitable take-offs. 29-02-2013 Aspiring Multi-day/multi-sport Circuit (Tramping/Mtneering/abseiling/rivercrossing&mtn biking across 3 glaciers: the Bonar, the Therma plus Lower & upper Volta. aka: 2013 U.V. (Upper Volta) Expedition aka: "Czech-Mate"
Following 3-4 previous attempt to visit and traverse the Therma & Volta glaciers to the north of Aspiring Geoff W invited Chris M. to join him on a photographic expedition and complete a trip through previous personally untraveled alpine terrain in late Jan. 2013. Hector Col/Slabs waterfall. 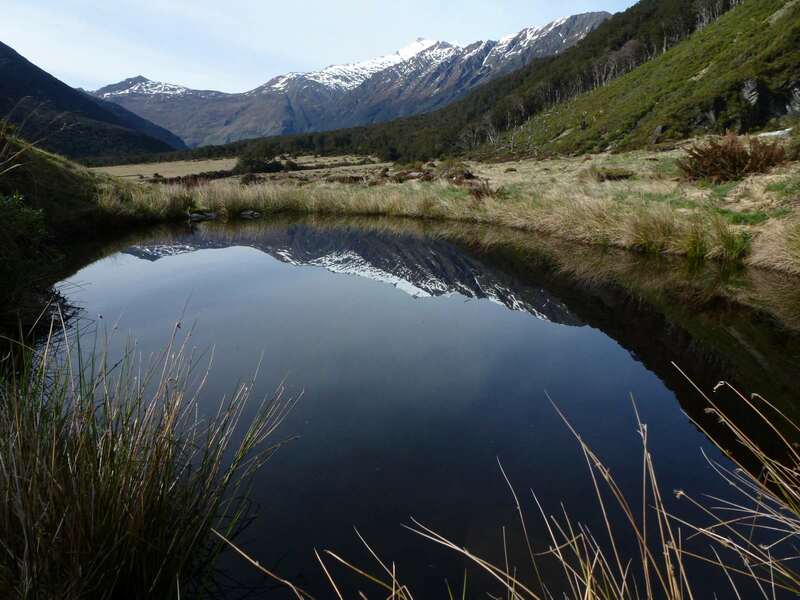 Source of Clutha River, NZ's largest river/Can be viewed on Mt. Aspiring Treks day trip from Shovel Flat. Moon over W.Coast & Chris on isolated rock on top Shipowner Rdge. Glacier Dome Lower Volta, Aspiring, Therma Gl. 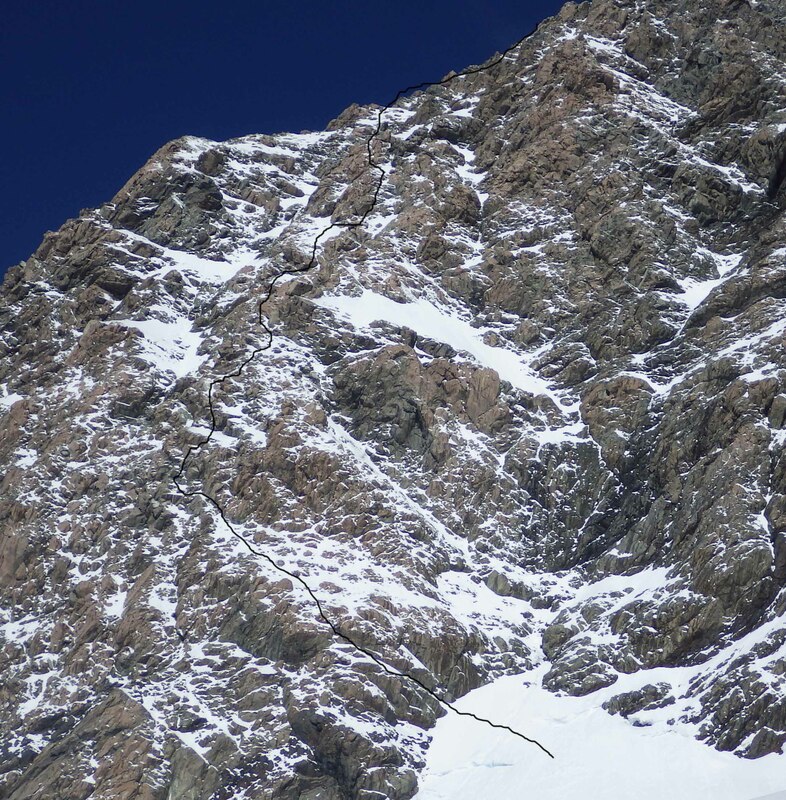 At Colin Todd hut we found out 2 Czech climbers had attempted the traverse a day earlier and turned back because of loose rock & encountered soft snow on retreat. As we followed their tracks through the Therma I was both impressed by their route-finding and apprehensive about solving the apparent difficult route issues. The thought of re-tracing our steps back up the Therma under cliffs in midday heat was oppressive. Could we get through the rock cliffs and rockfall? Some GW route-finding plus 2/20m abseils did it! Relief, for the moment .... beyond lay complex options to gain the Upper Volta. The answer lay in the Fastness Peak scree slope, which proved to be a straight-forward but tiring zig-zag to a spectacular knob at 1800m. 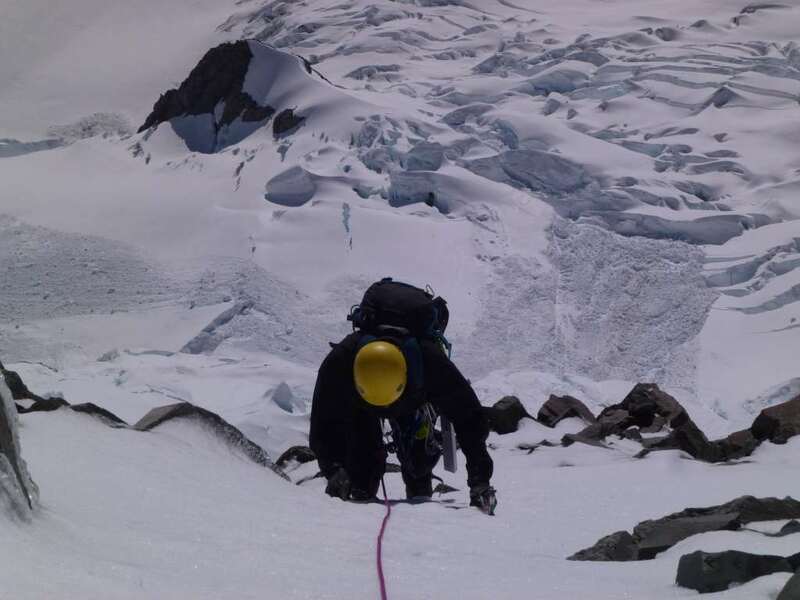 A tense, 4/25m abseils down a steep snow and rock gully using snow bollards and slinged knobs allowed us to gain the moderate ridge and descent into Ruth Flat. Day 5: Up over the Bledisloe Gorge to Junction, then Cameron Flat and bikes. The End nearly in sight and completion of the Aspiring/UV Circuit - "CzechMate!" Mt. 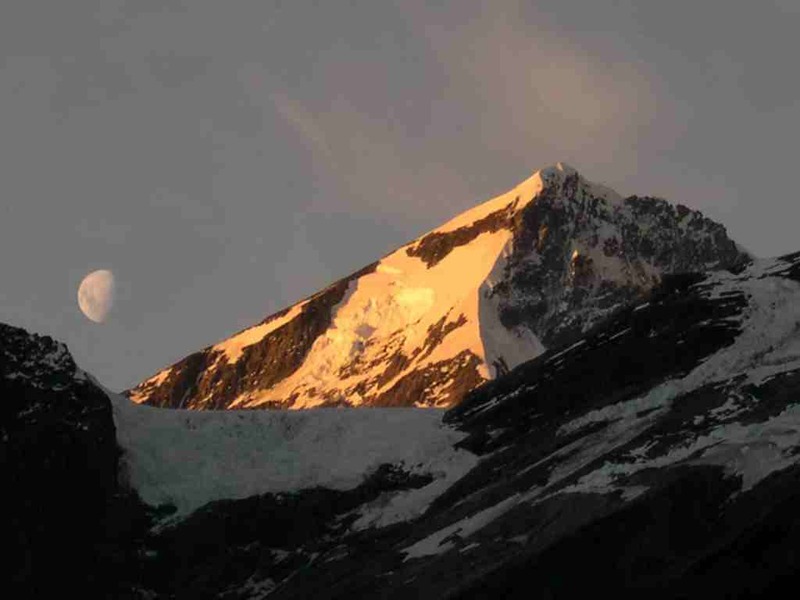 Aspiring Trek 3&4 day treks involves personal adventure in the company of an experienced Guide. 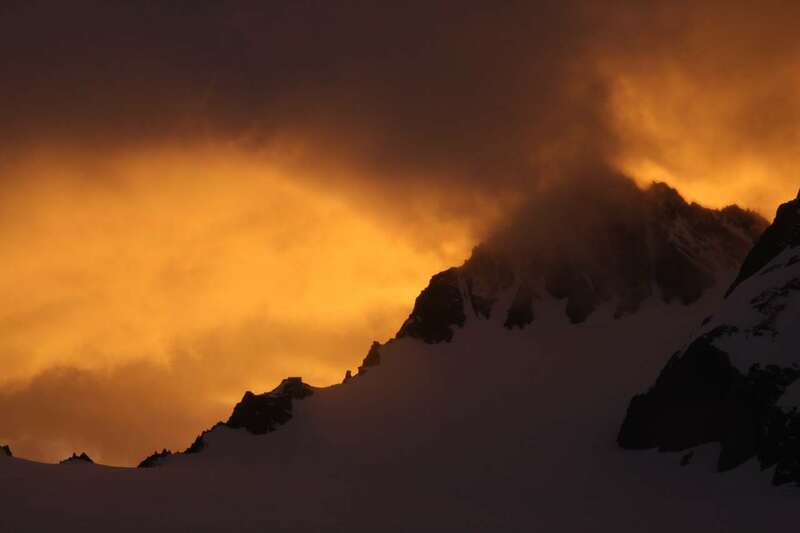 A colossal rockfall came only a few hundred metres from engulfing a popular climbers' hut in the Aoraki Mt Cook National Park. 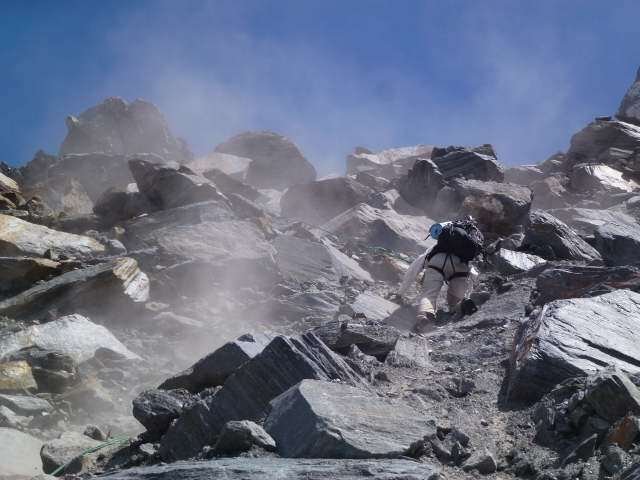 Twelve people were in the hut as huge quantities of rocks, which climbers described as sounding like a Boeing 747 coming through, plunged hundreds of metres down Mt Dixon about 2.15pm yesterday, shooting plumes of dust high into the air. No-one was injured, including other climbers who were further up Mt Dixon when the rockslide happened. 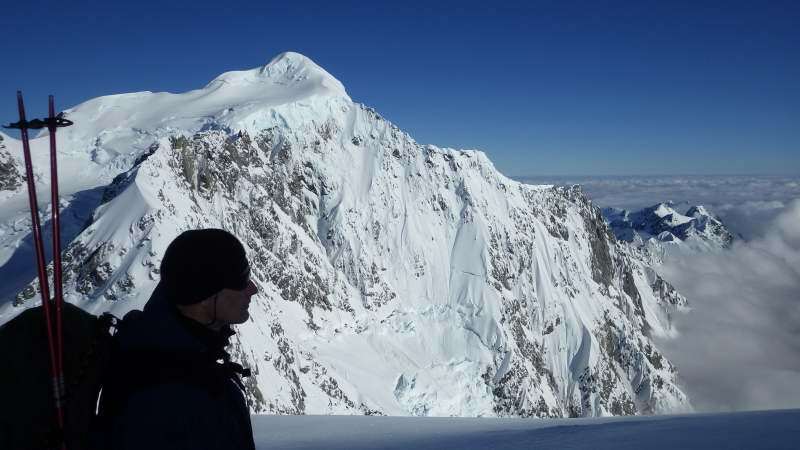 Climber Andrew McGregor, who was in the Plateau Hut, said the rocks came to a halt about 200 metres away. 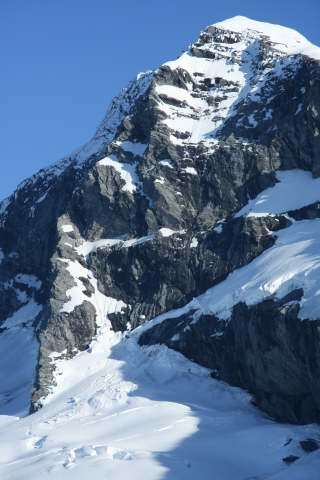 Once the avalanche had settled, it was about 3km by 500m in size, he said. 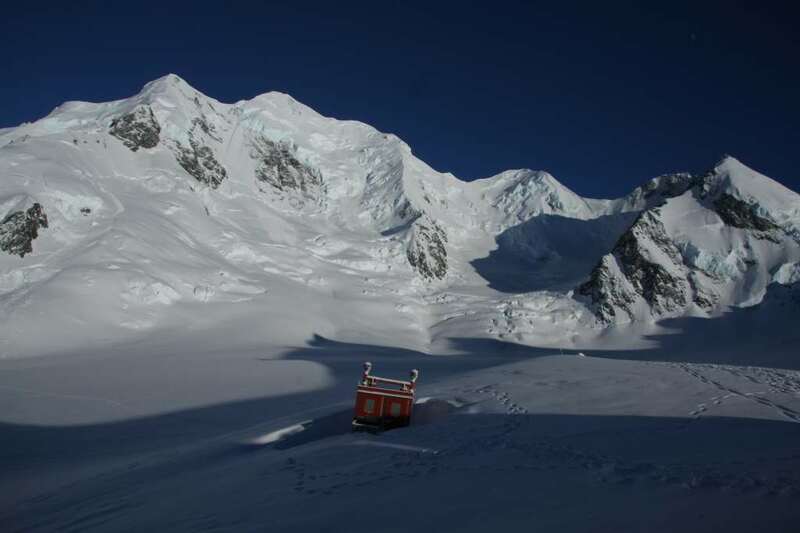 Department of Conservation spokeswoman Shirley Slatter said there were 12 climbers, including guides, in the hut at the time and a guide she had spoken to was "pretty amazed" by what was happening around them. 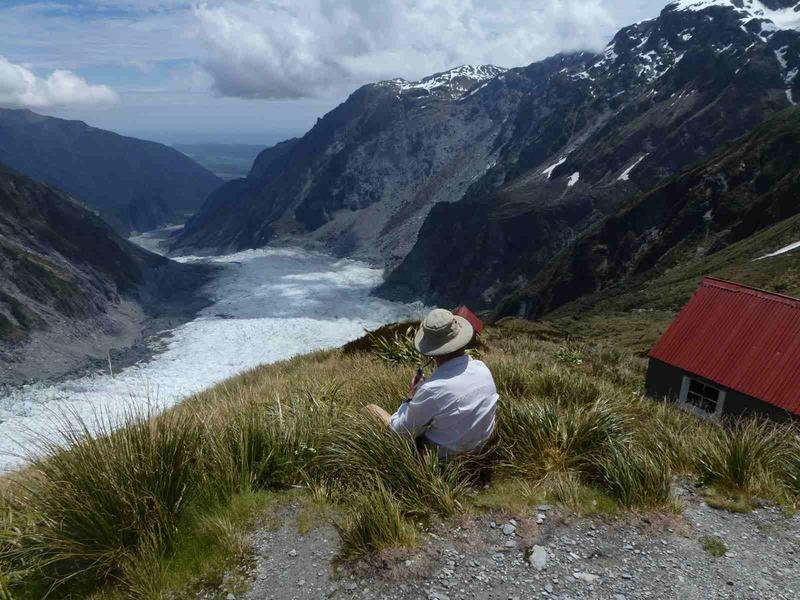 A party of three which was on Mt Dixon when the rockfall occurred, made its way back to the hut late in the afternoon. The decision was made to close the hut as debris came to rest within 150 to 200 metres of it. 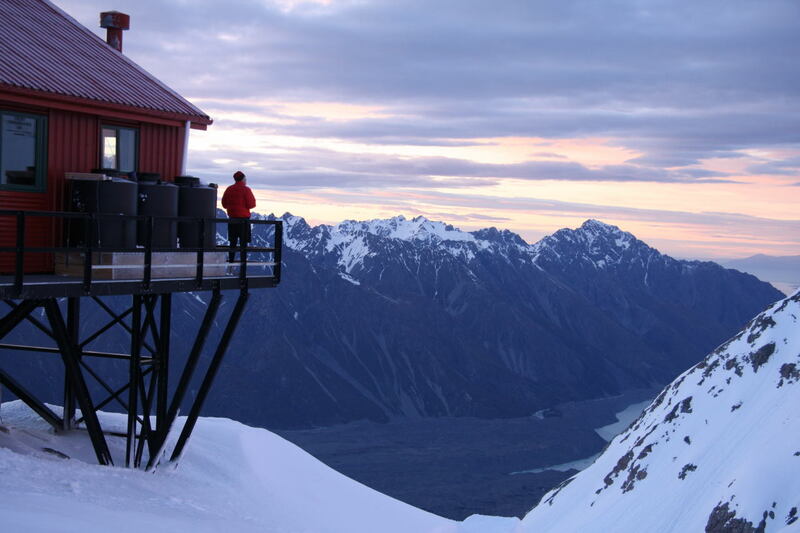 The climbers were flown out from the hut last night, with some choosing to be flown to other huts in the park to continue climbing. "There is the potential for more to come off, Slatter said. 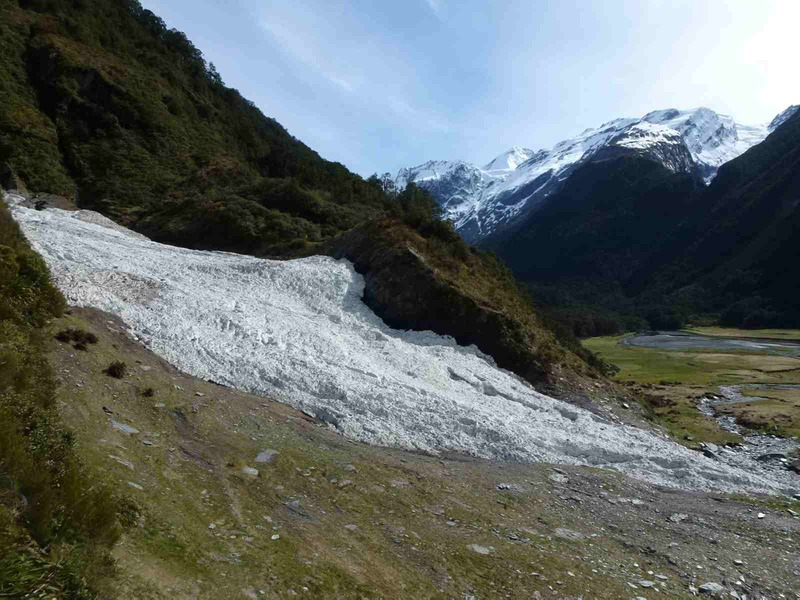 She said it was the largest rockslide in the park since the top 10 metres fell off Mt Cook in 1991. 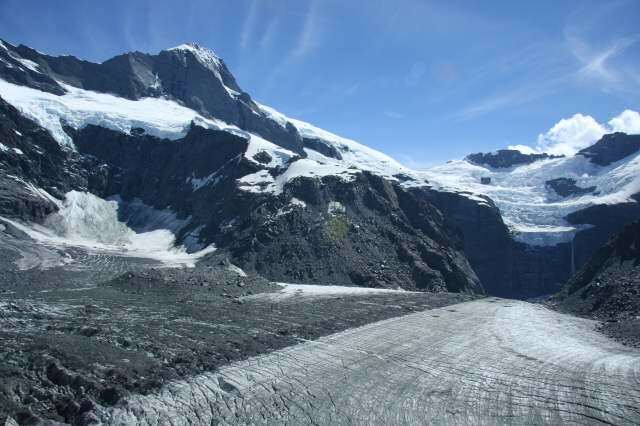 GW note: The large rockfall picked up snow and turned into a very large rock and wet snow ground slide reaching the Hochstetter Icefall crevasses. Wet snow avalanches often travel long distances on low incline terrain following terrain contours and troughs. 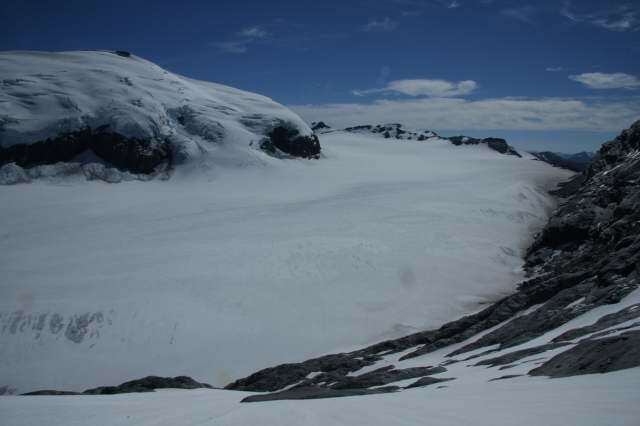 Although it came close, the Plateau hut is on a wide shelf about 50m above the main glacier. 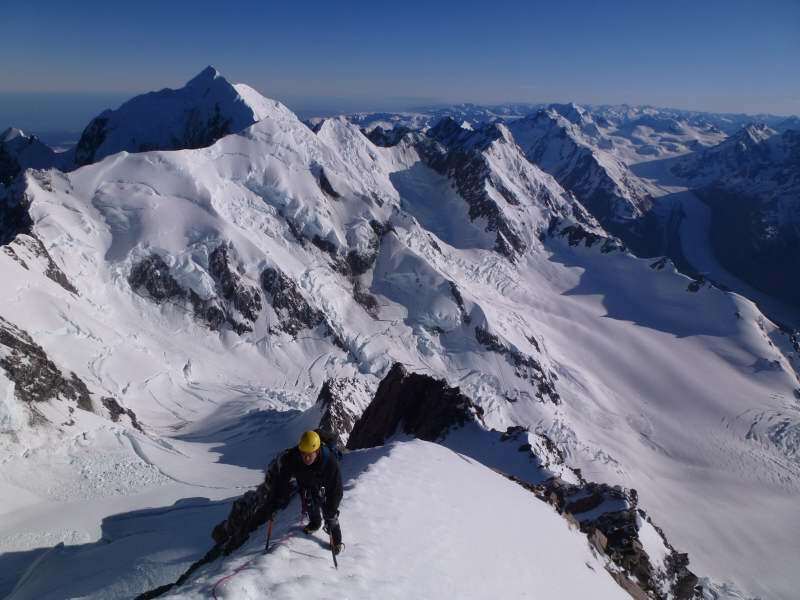 Extract from NZAC Mt Cook Guidebook - New routes now available? 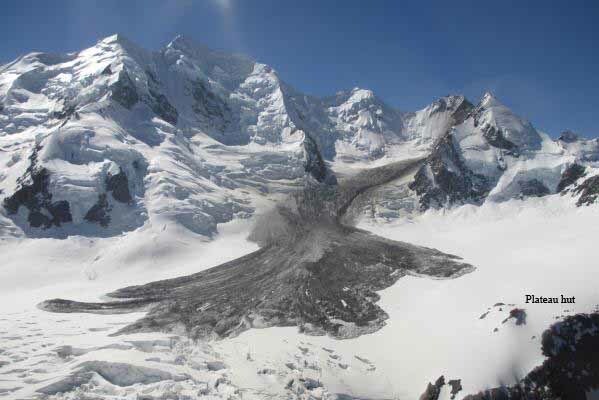 The avalanche was the largest in the Mt. Cook region since the 55mill.cu/m., 1991 Mt. 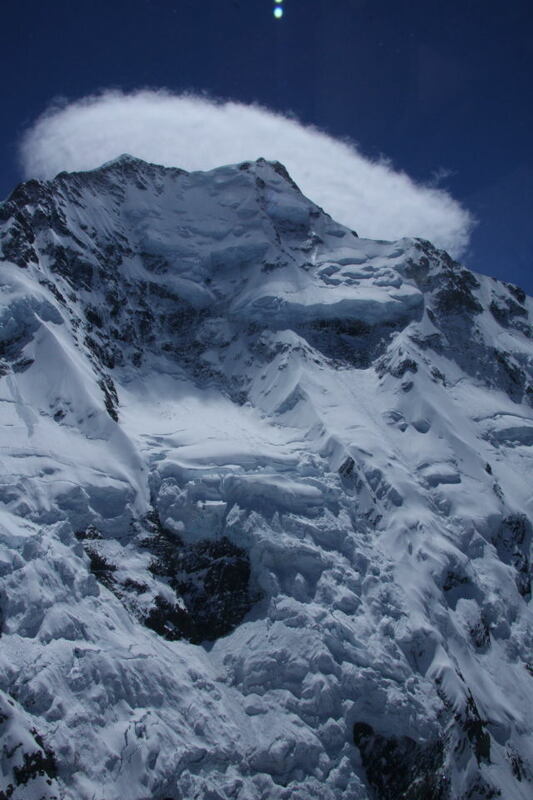 Cook avalanche which also lowered it's summit by 10mts. to 3754m. Note1: I have just been reminded by old mate Bob Schneider that Joshua Tree in in California. txs Bob. 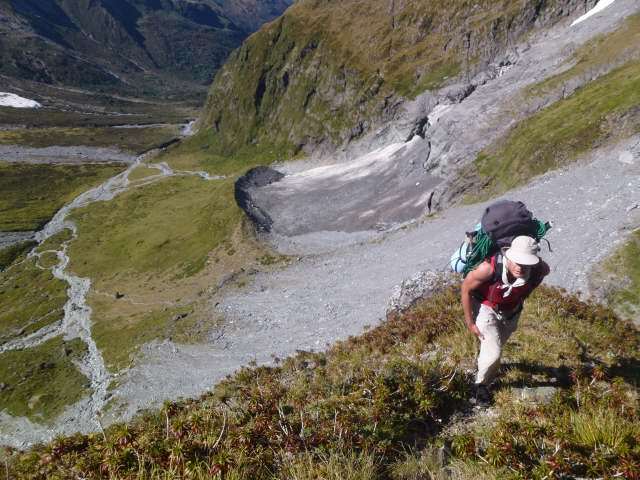 Cascade Saddle Accident: The body of a German tramper was recovered from a gully near the top of the Cullers Route on xmas day. He was tramping alone and started on 29Nov and apparently fell from a snowpatch near the Pylon top. Late Spring snowfalls and cool temperatures retard melting on the upper part of the steep route between the West Matukiutki valley and the Dart valley. The location has been the site of 2 previous fatalities which have occurred. It is not known if he had alpine boots, ice axe or crampons. 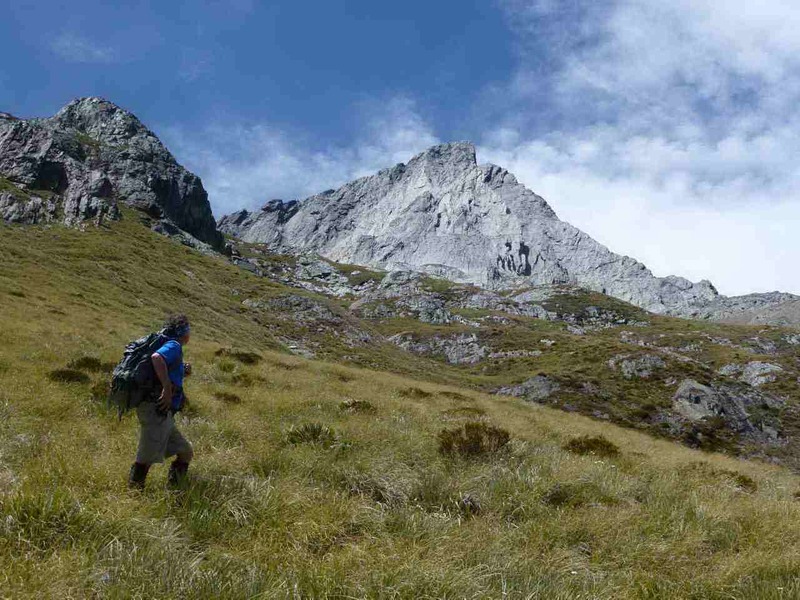 The route is a serious and committing alpine/tramping undertaking. 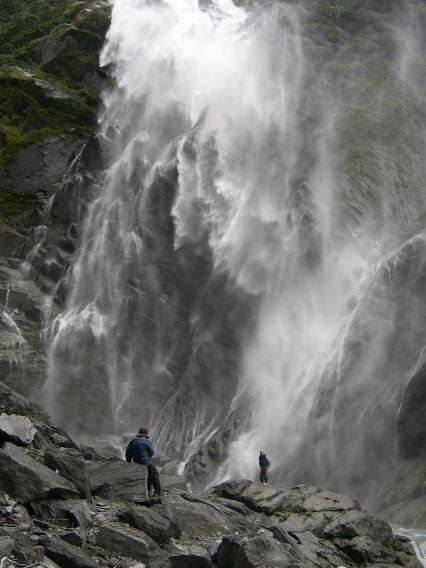 However, it features in Lonely Planet Guidebooks and is a recognised tramping circuit between Wanaka and Glenorchy. 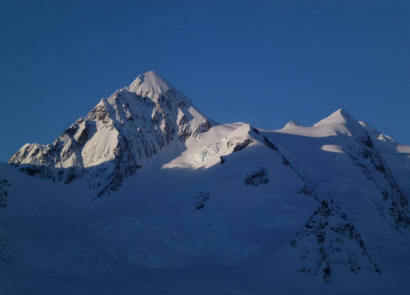 24-12-12 : 3x Cook ascents in 6wks: A superb weather pre-Xmas climbing period has concluded in very warm temps. It's been a pretty surprisingly fine Spring with significant snowfalls and periodic high pressures through the SI. 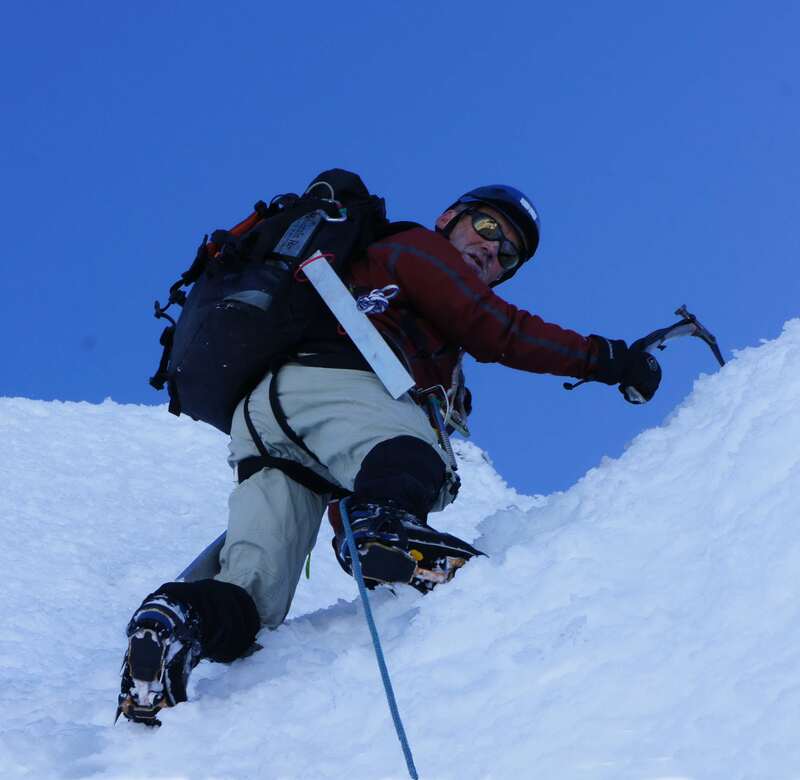 Geoff and teams were able to do some challenging expeditions (see below). 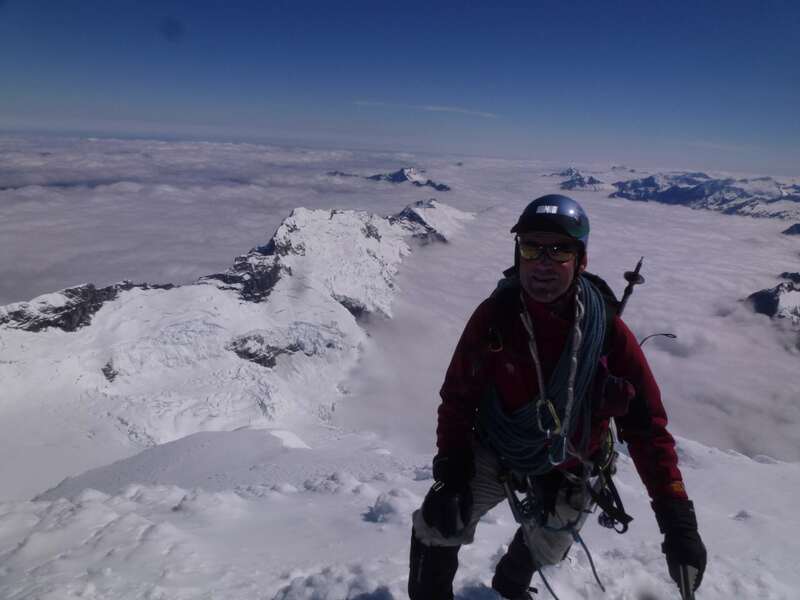 Excellent wx conditions and with a capable crew enabled Geoff to complete an unusual personal trifecta of 3x Mt. Cook ascents in a 6wk season. 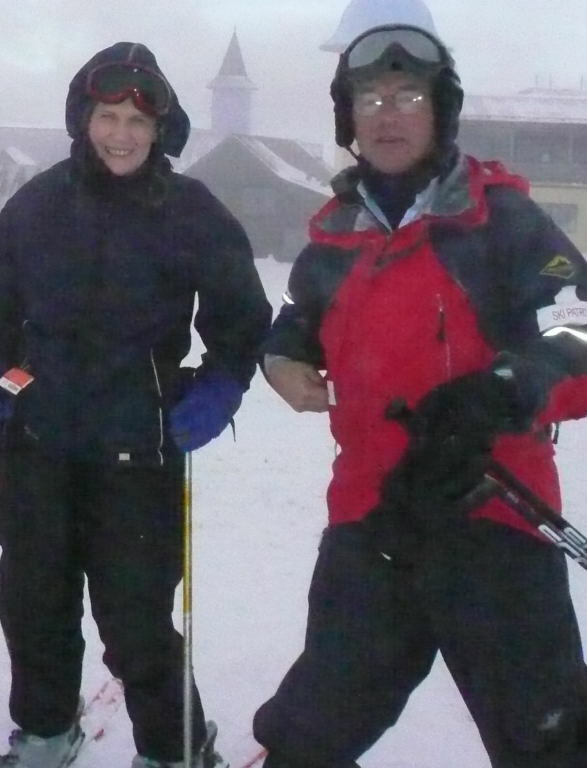 It also gave him a re-newed insight into the arduous and exacting Linda climb in a variety of snow conditions. 20-12-12: Cook again - A fine wx morning window/then opened to the wind: Geoff & Joe M. grabbed a one-day window to climb Cook via the Linda Glacier. The forecast gale force Nor-wester meant we had to complete the climb fast and efficiently. A surprisingly good freeze helped us up the Linda glacier. Finally I found the best line through the Summit rocks and then we scratched up the wind-polished summit icecap sustrugi. I reminded Joe: "You do the climb for yourself and the return journey for your family. After 3hrs. 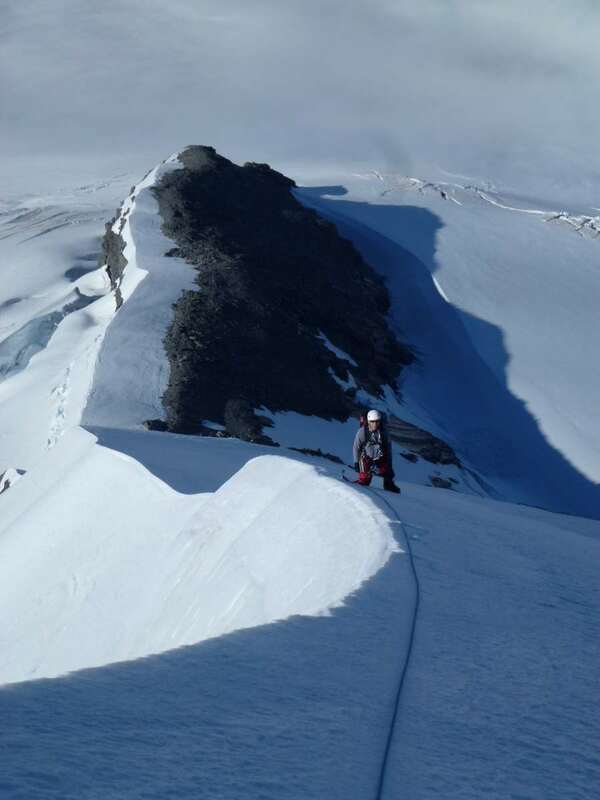 involving 700m of down-climbing, including 8 pitches and 3 abseils we reached the Linda Ice Shelf. After another 3hrs of descent in gale force winds and softening Linda snow we finally snow-shoed into Plateau hut after an 18hr climb of continuous effort. The hut was empty. The 4 guided parties of 8 had vacated to the Mt. Cook Village by heli in face of the fast moving front. They'd pulled out on the IceShelf at dawn in the face of firm conditions, slow speed and frontal timing. To climb Cook isn't an easy task. Joe and I had spent the past ten years building skills and experience. It had been a long and fruitful journey from the Copeland Pass crossing in 2000 to Cook in 2012. 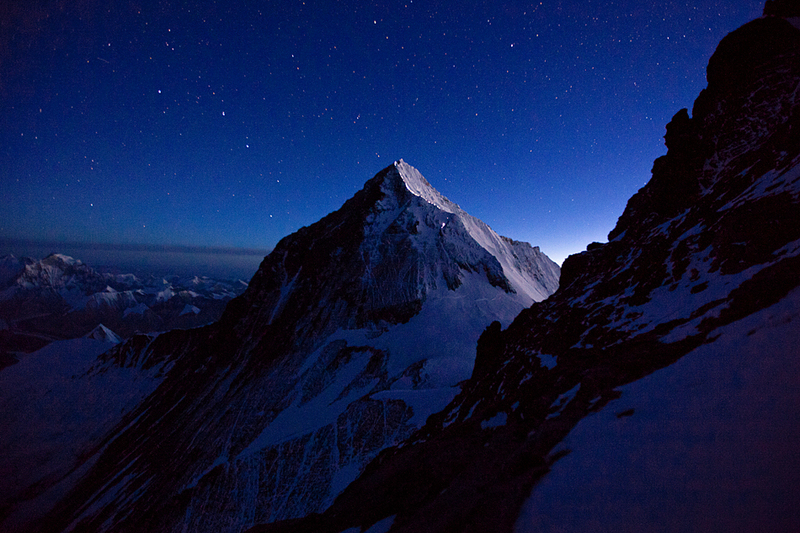 It's been my long held philosophy: "Focus on the climbs and the summits will arrive." 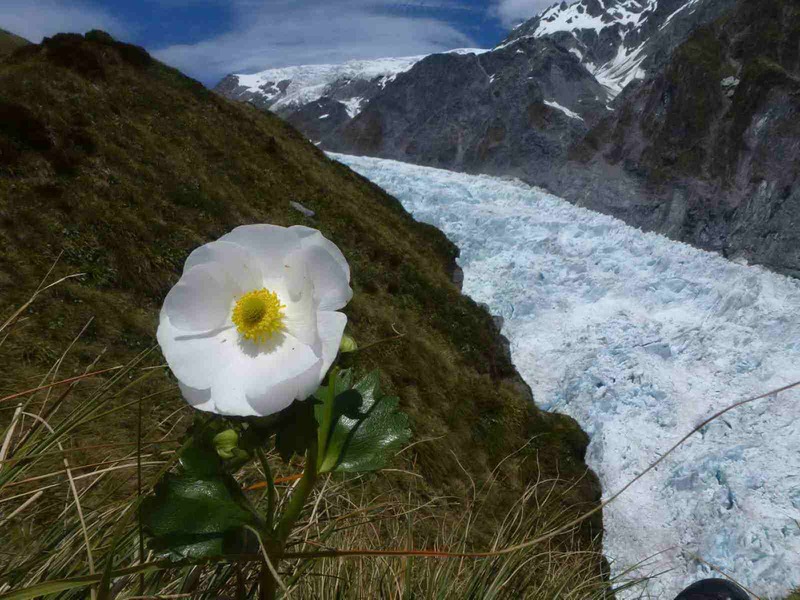 Mt Aspiring Treks: It's alpine flower season. They are blooming spectacular! 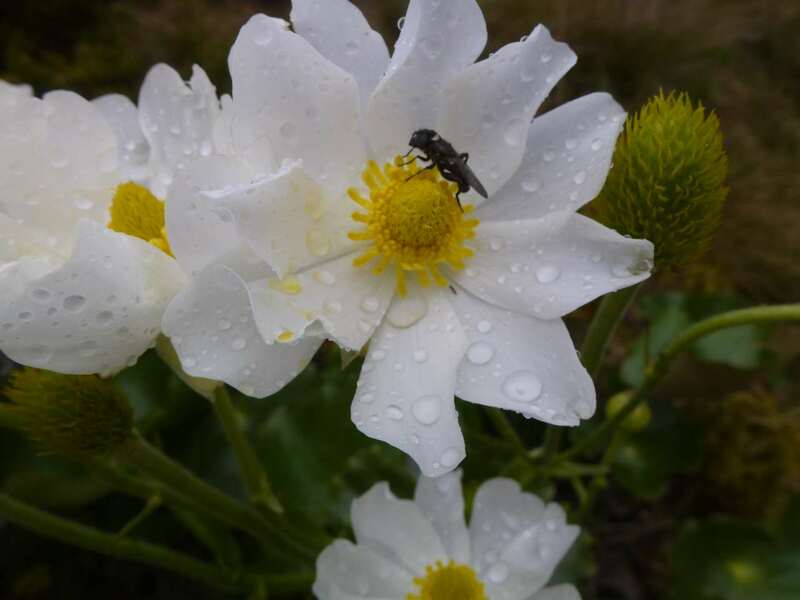 Join us at Avalanche Lodge, Shovel Flat for an alpine flora & mountain valley tour. ASPIRING: 87-7/8ths? Does a fraction short of the Summit count? If it does then I can claim 7/8ths of an ascent last Sunday. Cultural Respectful Summit? Did we stop short of the peak for cultural reasons? No, it was "verglas", that glaze of impenetrable ice formed by "freezing rain" and hardened by a strong cold SW wind. Turning back is disappointing, but it's an important climbing skill to learn. The lasting satisfaction should come from the effort, after-all mountaineering is only a game, though Hemingway regarded it as one of the toughest. 3 Wise Men? We turned back 150m short of Aspiring's summit. The risk and lateness made the collective decision a "no brainer". 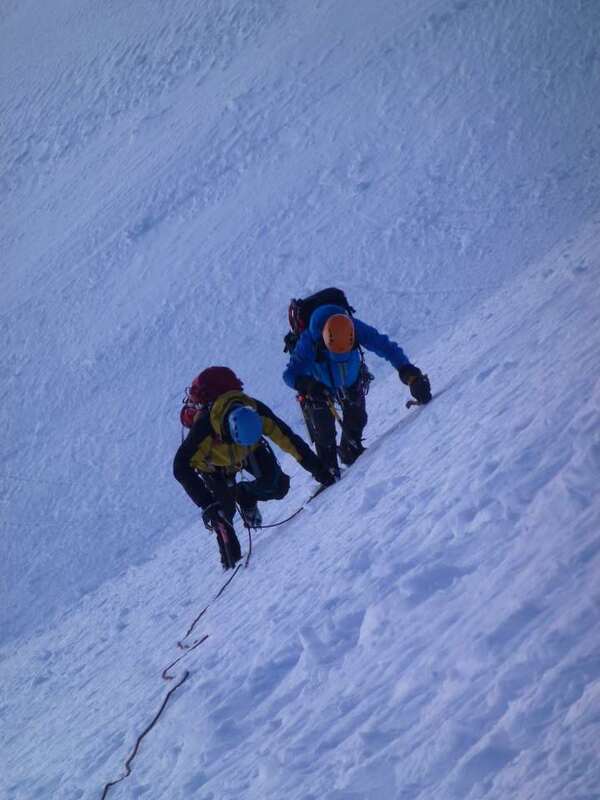 We'd put in a huge effort step-plugging across the Bonar in breakable crust, then climbing 10 pitches to the Shoulder. 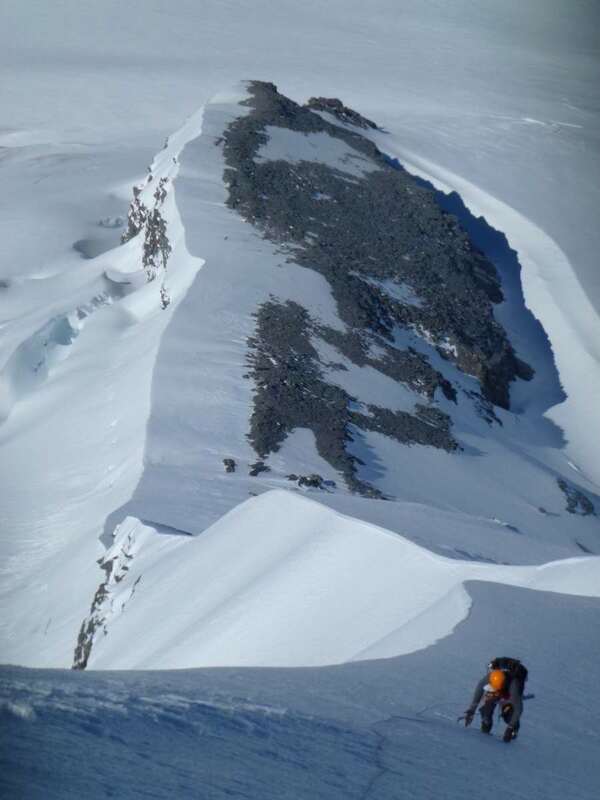 The tentatively scratching of crampons up 300m of moderate, but very exposed sheet ice was nerve-racking, hence stopping just short of the steeper summit triangle as the downclimb was to be just as arduous. Break-away Glide-slab activity: Monday 13th: Woke up on the Mt. French bivi ledges in a Dawn white-out with ice encrusted bivi bags, drizzle and wind. Yuk - opted to bail-out for the valley via the Break-away. Got through the mid-section ridge-line with a 25m abseil off an ice bollard into an isolated glide-slab gap and rapid exit through some ice blocks. this is likely to be the last for the season as observed glide-slab activity on Mt. 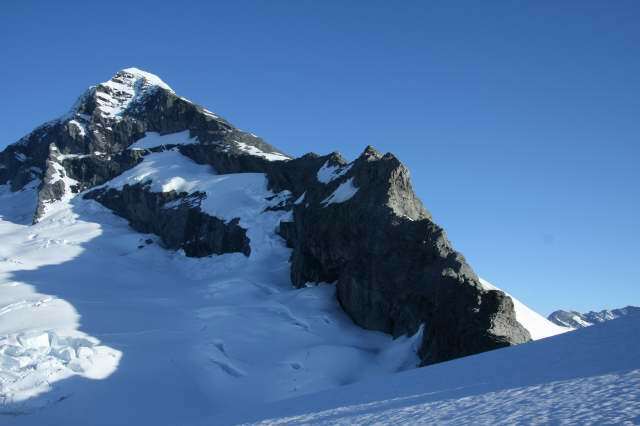 Joffre will likely be replicated on Mt. French's Break-away route. The usual glide-slab break-up timing on the 35-40deg west facing slopes 1800-2400m around 1st-3rd week December. Observe Rob Roy from French Ridge hut. 1: 29/11: Anna Glacier - Stopped by "Moat" mid-glacier, then long ski off Hochstetter Dome via Lendenfeldt Saddle to Tasman Saddle hut. 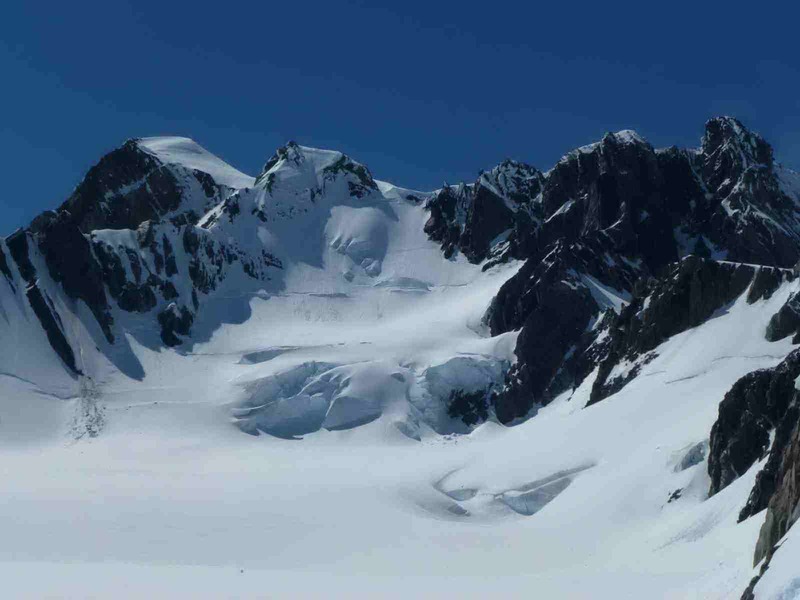 Tasman Saddle/Peak 9144 (2669m): Viewed a promising pencil-like snow couloir from Tas. hut but on close scrutiny decided it was a projectile "funnel." Didn't like the unstable snow/slush on Abel (2688m). By the time we found a promising looking West facing wide couloir, with minimal rockfall threat the weather was decidedly inclement. It was a reasonable 4 pitch climb in less than perfect snow and weather conditions (understatement!) followed by a circuitous ski sidle back to Tas. hut. 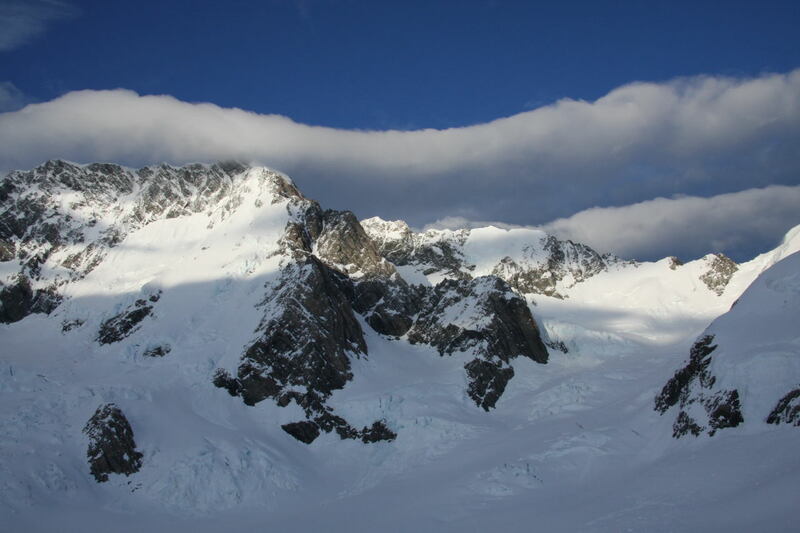 3: Mannering Glacier: Descended off Starvation Col 200m to skin up the steep SE face of Cooper to gain the summit. 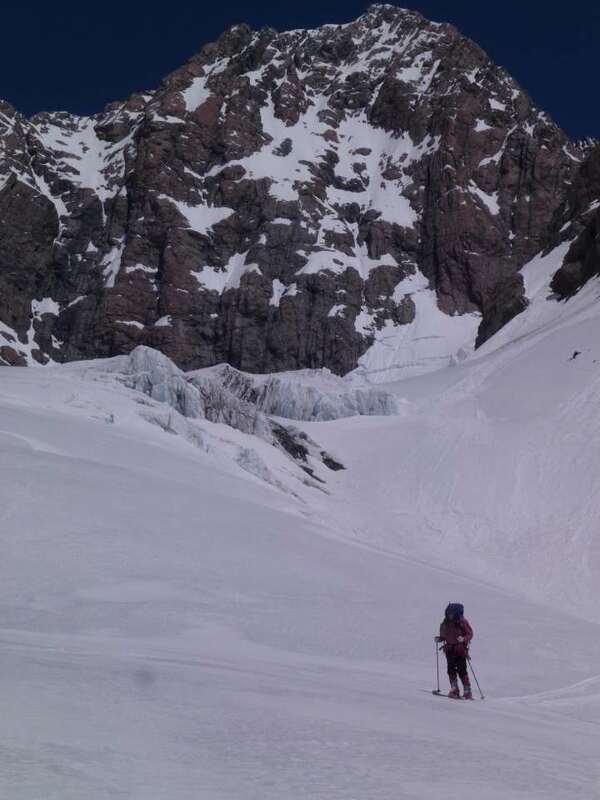 It's Murchison face offered a ski then steep sidle to re-gain the upper Murchison and narly headwall frequented by occasional surface sluffs and at-limit skinning. 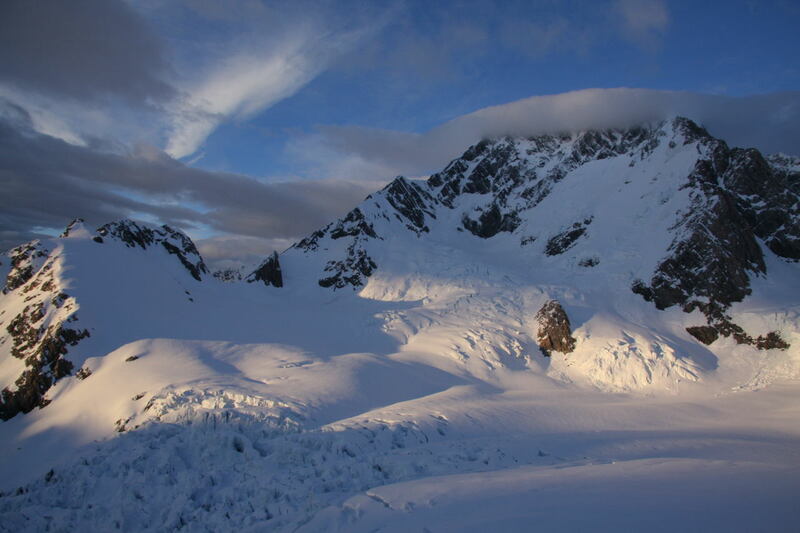 4: 01/12: Tasman Glacier: 7.30am ski down powder patches and ice. Lots of fun linking powder and skidding across edgy ice. Inspite of the heavy packs it was a great "Ski the Tasman" experience to Darwin Corner. 5: Darwin Glacier: Skinned up to fork under Hamilton. 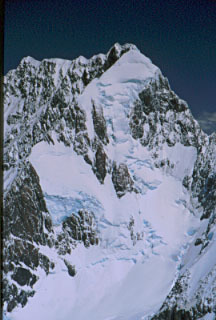 6: Bonney Glacier: Skinned to upper basin and pigeon-hole climbed Rumdoodle face to narrow summit ridge. Skied corn snow to Darwin and Tasman gear drop, then on down snow, then white-ice hummocks to heli-pick-up by B3/Mark H. I can't believe I hadn't discovered the delight of the Bonney in the late Sixties! Last Fri (16th) a lone Canadian climber got stranded on the top of the Quarterdeck4 in a whiteout, had a small slip, decided to dig a snow-hole and sit out the storm. His use of a Spot beacon enabled his Dad to track his movements. At midday Sat he pressed his SOS button and RCC was alerted. 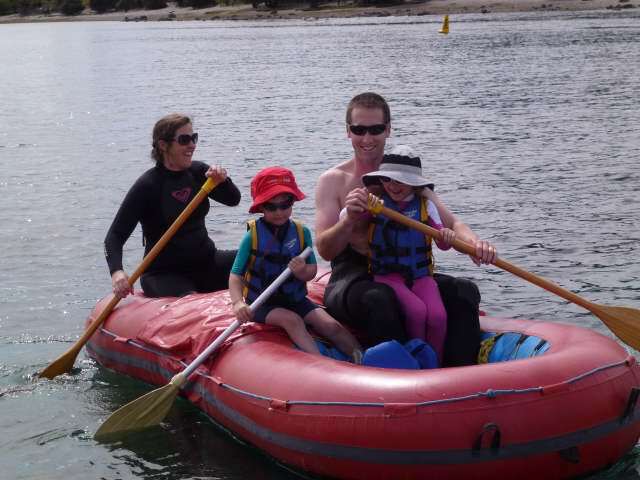 A Team of 4 Wanaka ACR members incl. 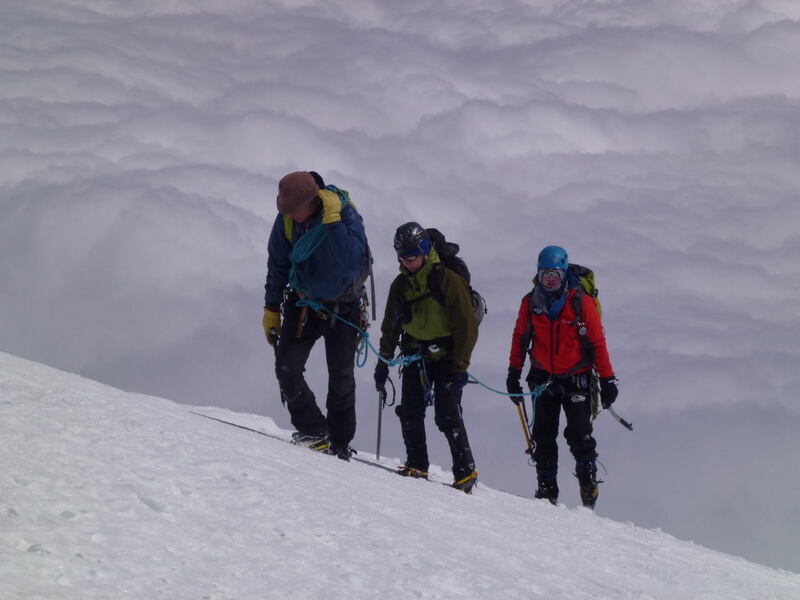 GW attempted, in vain, to retrieve the climber in inclement wx. With the the prospect of a 2nd night out the team prepared to extract a hypothermic patient by air or ground on Sunday. Fortunately, the climber survived Ok, except for weariness, dehydration and snowblindness. His gear was wet but not sodden. 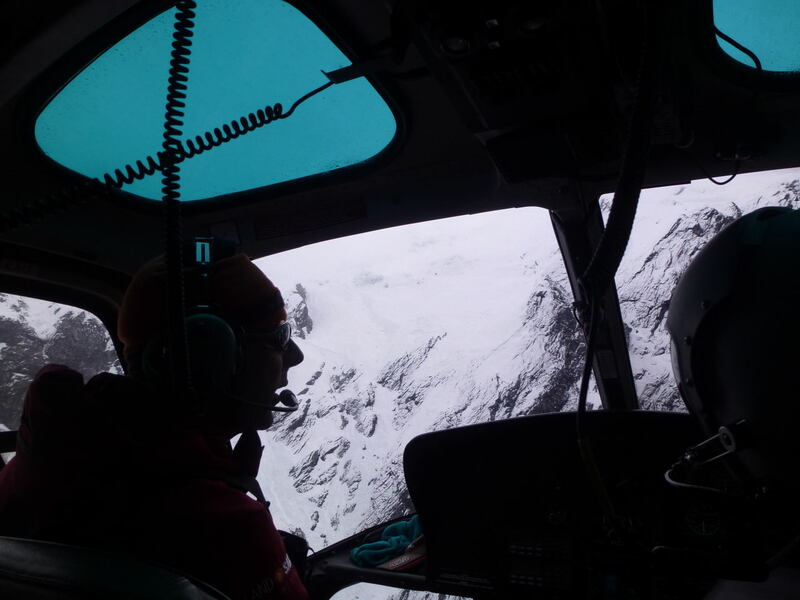 Lessons: Soloing across a glacier in white-out to meet a plane schedule is high risk. The Spot Beacons are useful for your Base or Searchers but does provide a useful GPS "track" for the navigator. The Quarterdeck and "Q'Deck Pass?" as marked on the map is confusing. 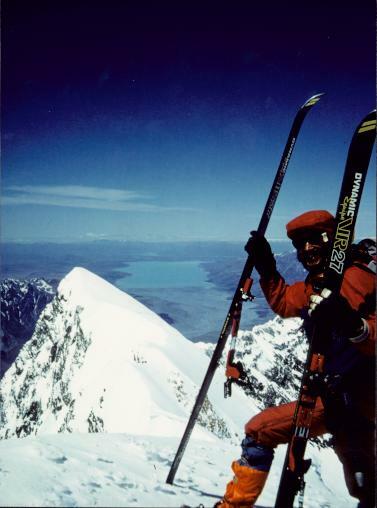 30 years ago to date John Blennerhassett and I completed the first ski descent of Mt Cook. Check out my Dynamic VR17/200cm slalom skis on the Mt. Cook Visitor Ctr. wall. Companion, Chris M. and I left Plateau hut at 1am on snowshoes and punched up the powder filled Linda Glacier to the L. Shelf at daylight (5am). 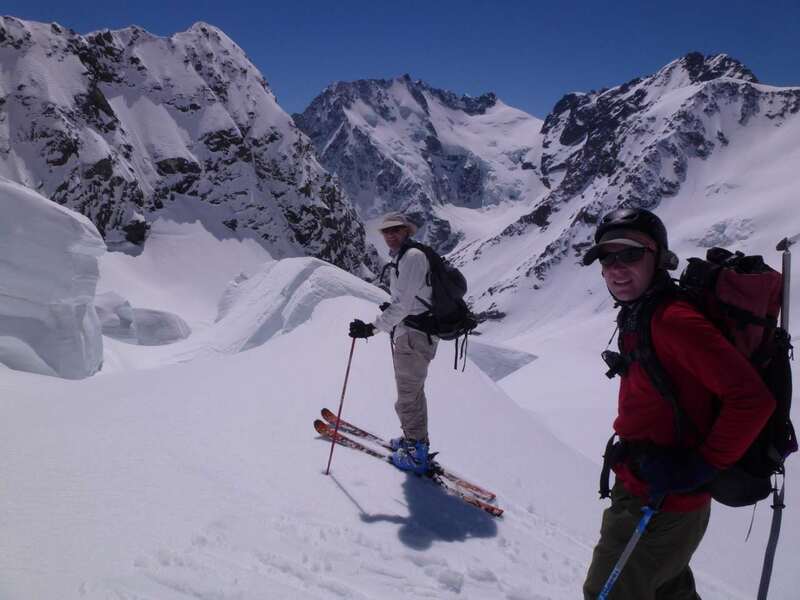 "Climbs have a History, an Aesthetic and an Ethic"
Fresh, thigh deep powder snow slowed us down along with powder over the Summit Rocks and schrund bypass onto the Nth. Ridge. Freddie, Julie & Jono combined with us for step-plugging on the Linda Shelf & then doing six rappels down the Summit Rocks in late afternoon. 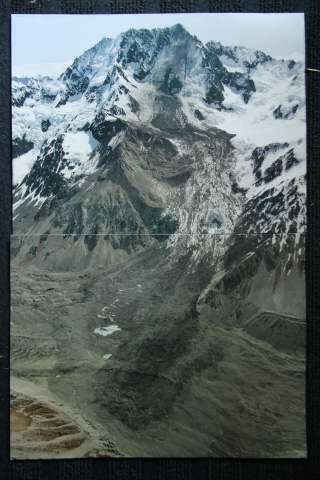 There have been significant glacial & mtn. changes over past decades, but the Grand Plateau remains one of the grandest mtn. locations in the World. 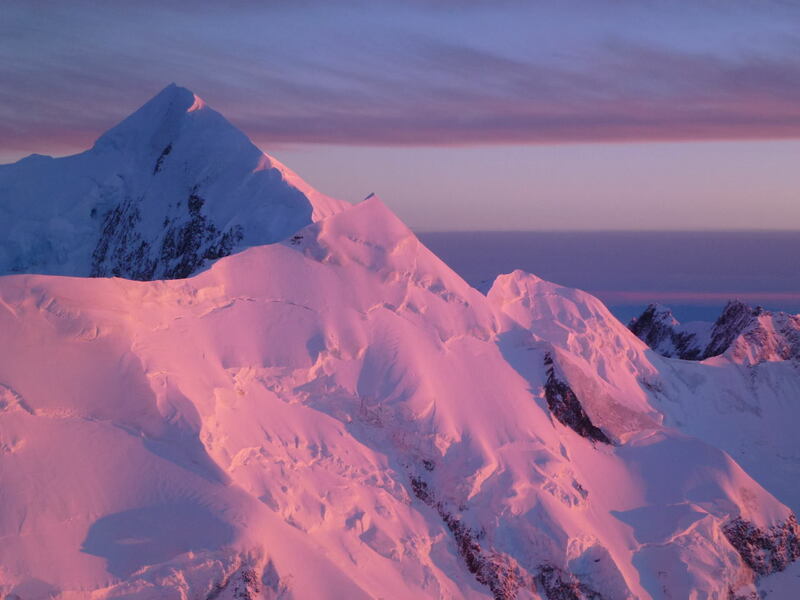 Tasman's Symes Ridge, a long-time classic still in premium knife-edge, early season condition from the Grand Plateau, dependent on lower ridge and Nth Shoulder/schrund access. Plateau Hut, a 3 bunkroom, 30 person hut is accessible by helicopter and a spectacular location on the Grand Plateau for a few days of alpine soliloquy. Mt. Cook's 2,000m. Caroline Face - Attempted extreme ski descent? As viewed enroute to Gnd. Plat. from safety of helicopter cabin. 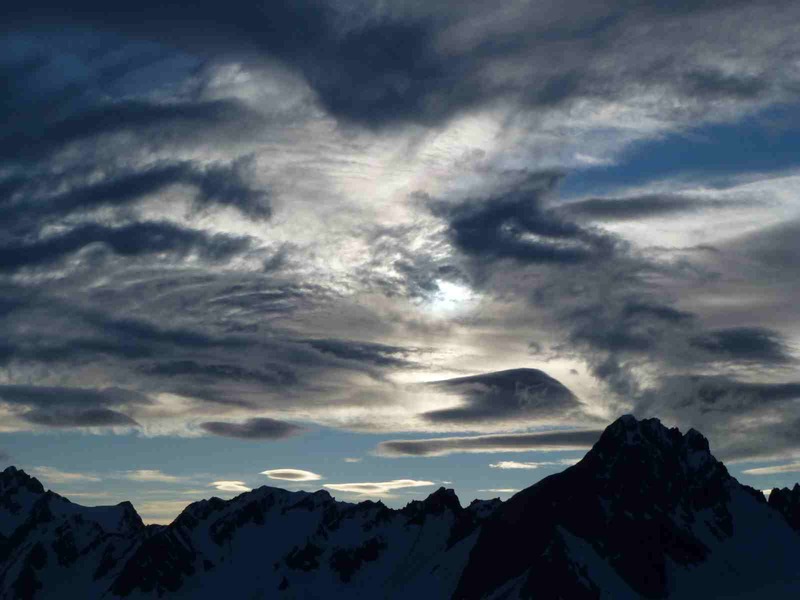 Aoraki, the cloud-piercer & Linda Glacier shrouded by a moist, westerly flow. The 20 pitch Zurbriggen's route/45/50deg. ext. ski descent slope left centre. 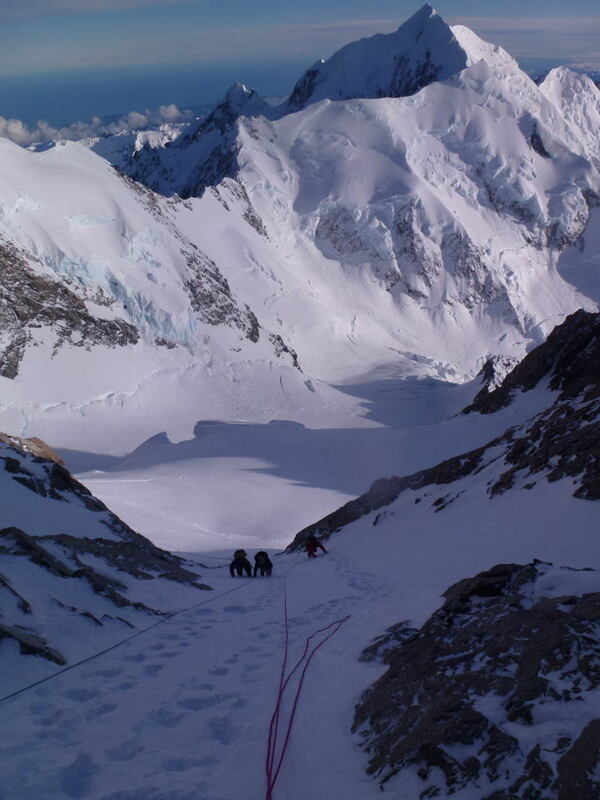 NZ Vertical Limit - 24 in 46 - Last Monday (05 Nov 2012) Geoff W and Philip S. climbed Aoraki/Mt. 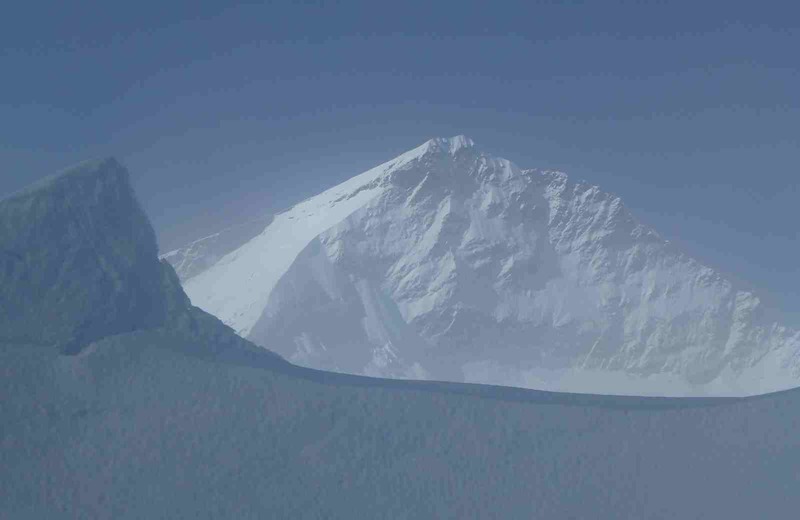 Cook (3754m) in testing, cold southerly conditions with the summit rocks covered in powder snow. A late afternoon snowstorm slowed the descent into a 20hr test of endurance for the veterans. GW summit satisfaction On Glacier Dome the day after & rested! "By and large, the whole thing is a mind game. It's a reduction to the most basic actions of breathing and moving...and knowing, not believing, that you can and will continue" Cory "COLD" Richards - 1st ascent, Gasherbrun II (8035m) Feb 2011, Rock&Ice, Issue 196 - 16 other parties tried and failed. 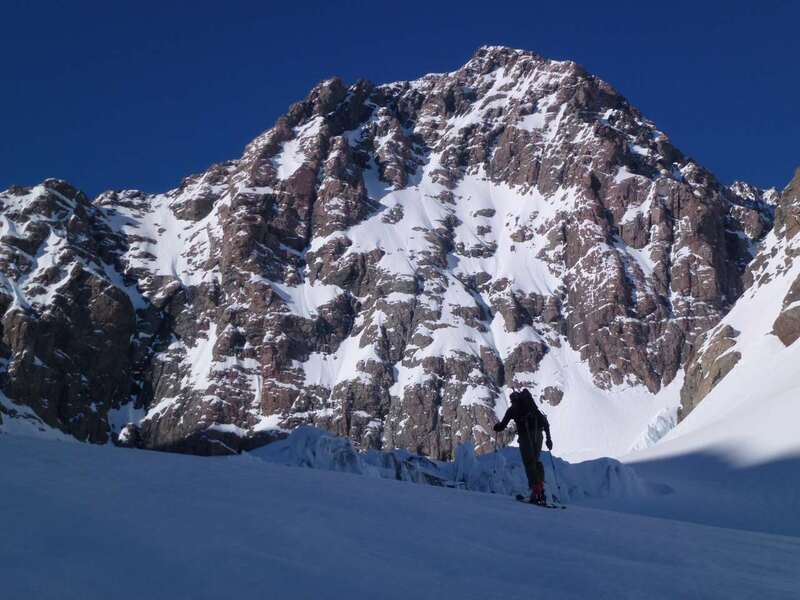 Nov 2012: Eli de Beaumont (3109m) is an excellent ski-mountaineering peak. 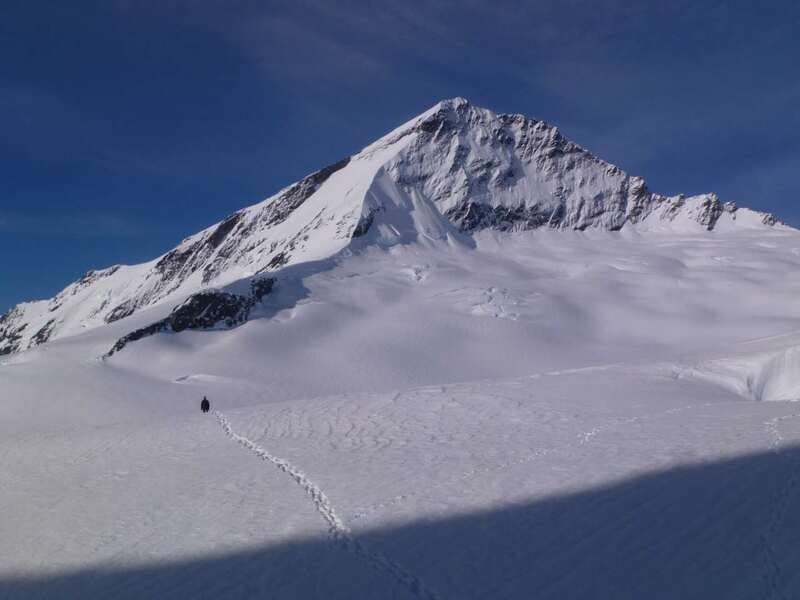 Geoff, Chris & Dave did a 7hr ascent up the Anna glacier in ideal weather & snow conditions from a tent camp on Lendenfeldt Saddle (2419m) plus Hochstetter Dome (Nth) 2810m. 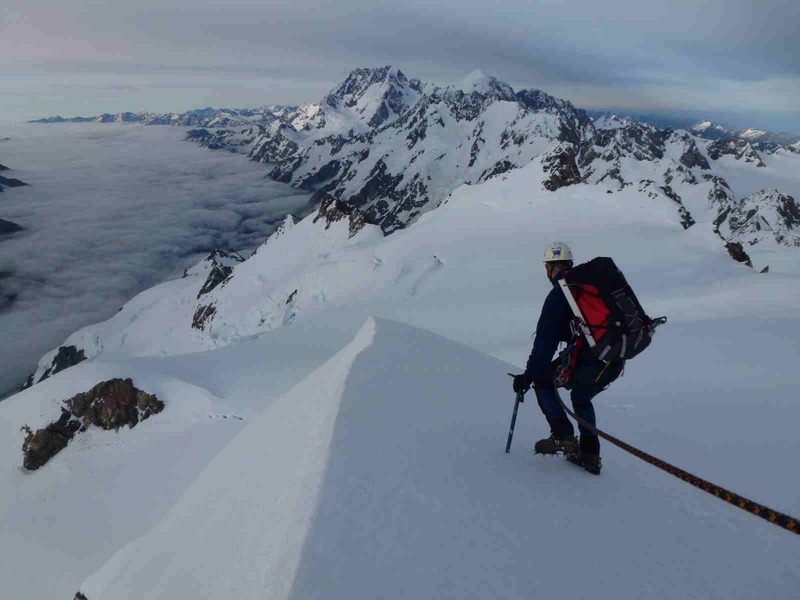 Fun climb peaks from Tent Camp on Tasman Gl with spectacular views of Minarets and Eli de Beaumont. 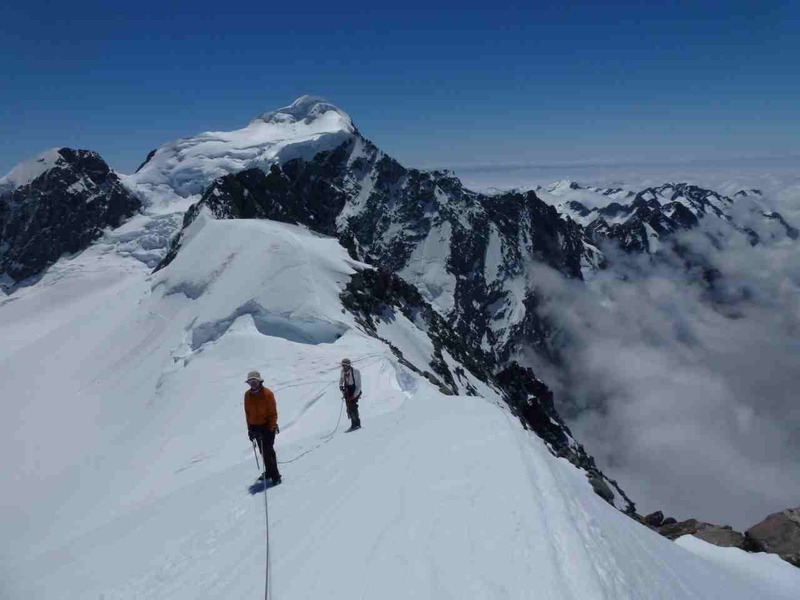 Four moderate pitches to knife edged walk to Divers Col plateau & possible bivi site. Green (2837m): Four short, sharp pitches. Mt. Walter (2809m) Pleasant short-rope ridge climb to summit. A parade of headlights from Sth Col to Sth Summit of Everest. 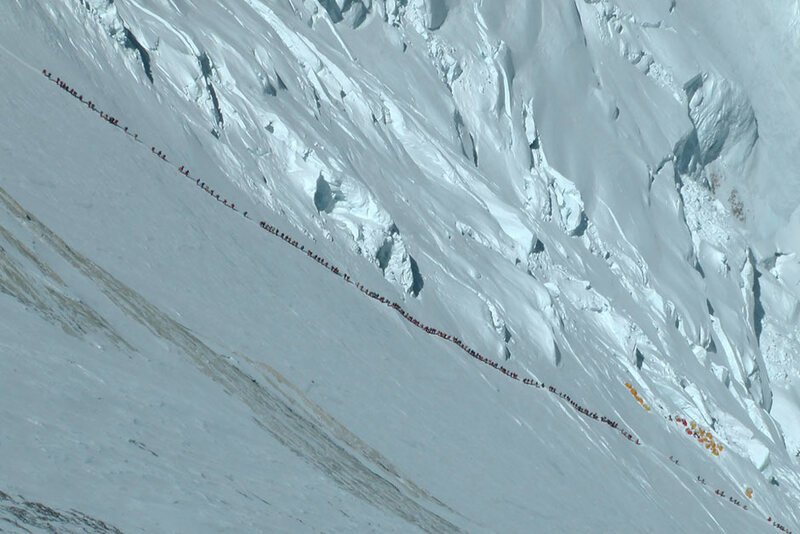 Everest Line-up: How many climbers can you fit on one mtn? ........is there something is missing on Everest? Warning - Do not carry teddy bears on your pack when climbing with Grant! 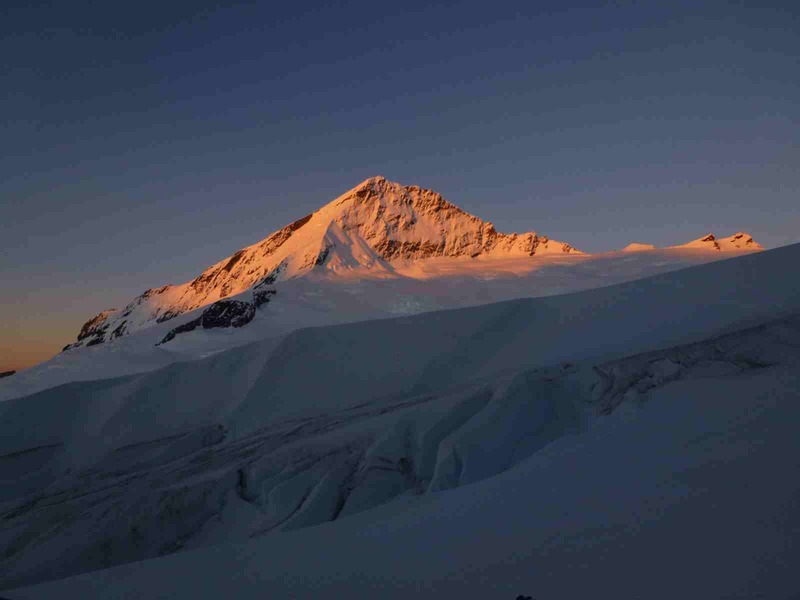 A female climber in the "death zone" above 8000m was unable to climb down a ladder, Grant Rawlinson wrote "She was shouting at her Tibetan guide at the top of the step. Descending the second step is not technically difficult, however it is extremely exposed in some parts and you don't want to fall. She seemed completely freaked out ... She looked like she was going to start crying. I felt absolutely no sympathy for her whatsoever. You don't come to the North East Ridge at 8700m and start getting climbing lessons while you hold everyone else up and they sit there using up their life blood supply of oxygen." The climber was eventually helped down. 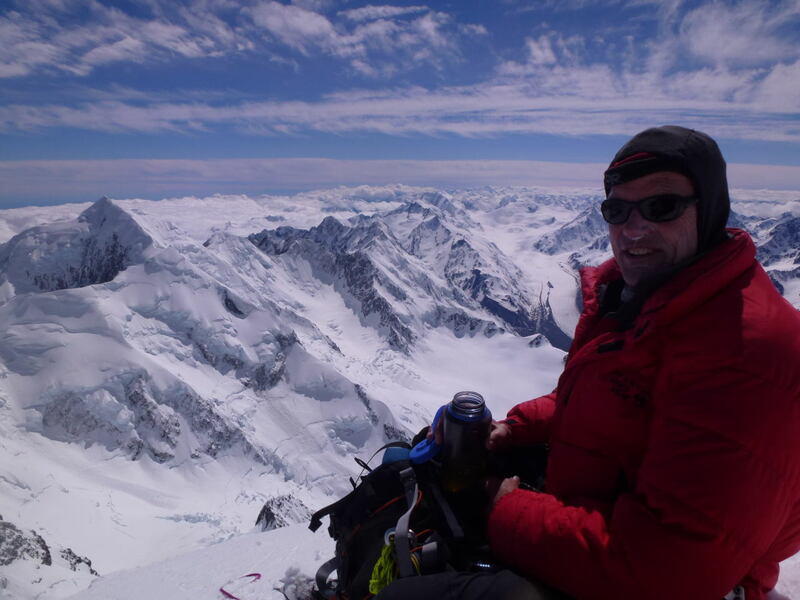 From Taranaki and based in Singapore, Mr Rawlinson has 12 years mountaineering experience, including a previous unsuccessful attempt on Everest. "And this girl had turned up here without even the ability to downclimb a ladder. The spectacle I was seeing repulsed me. People turning up with no respect for the mountain. The desire for instant gratification without the discipline to do the hard yards, the research, the training and the preparation." Earlier, Mr Rawlinson was held up by two struggling climbers with teddy bears attached to their packs. "I contemplated pulling the teddy bears off their backpacks, setting them on fire and shoving them up their backsides. Maybe this would motivate them to climb faster?" 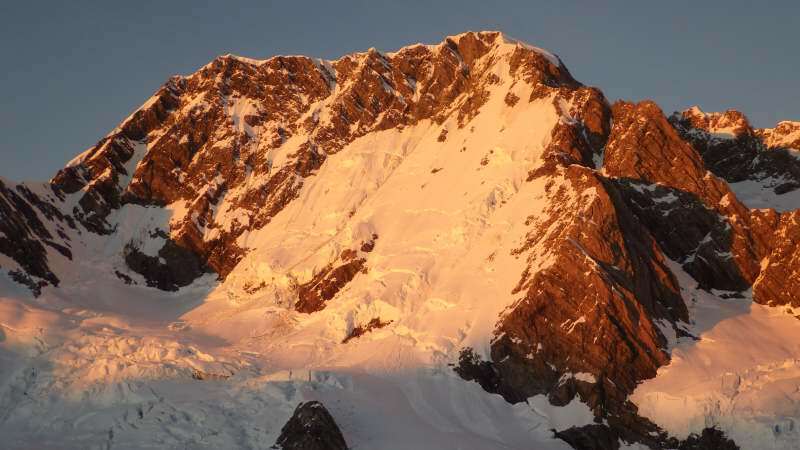 Four climbers died hours after Mr Rawlinson reached the summit on May 19. VF – apply 3 DC shocks – transport to unit with cardiopul/bypass plus serum potassium measurement Asystole /If known airpocket and free airway/Continue resus/VF: Apply 3 DC shocks, transport to unit with cardiopul/bypass plus serum potassium measurement. 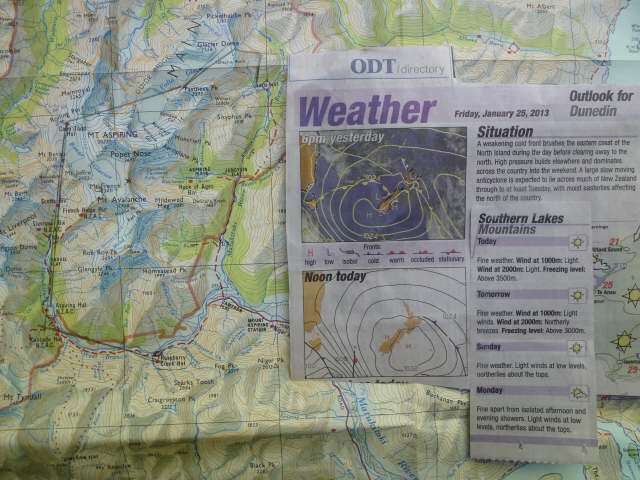 Weather & Ski-touring Tips by Geoff W.
Transit of Venus - 06 June, 10am-4pm Watch w/lens on card. 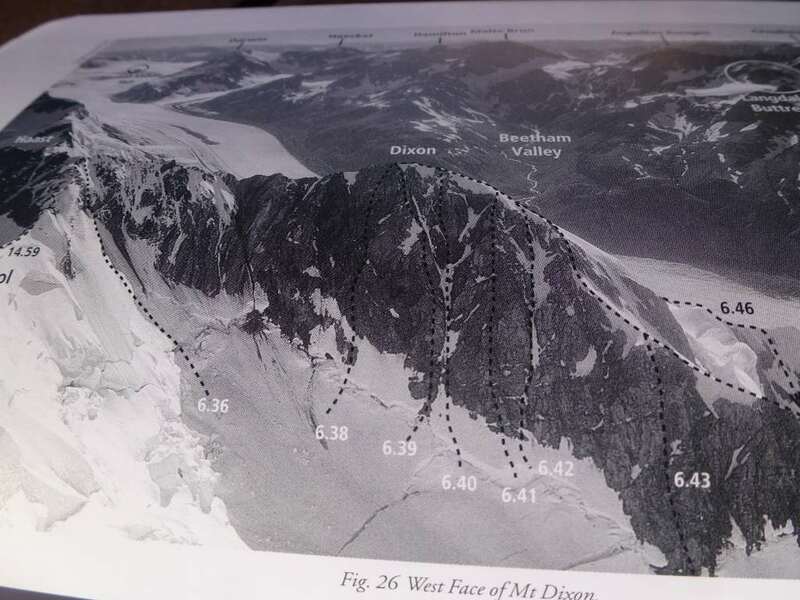 03 May: Confusion over a "panic date" led to an un-necessary LandSAR Operation involving 3 ACR team members (Lionel C, Davie R & Geoff W spending the morning completing a hasty aerial search of the Corner Peak access routes. 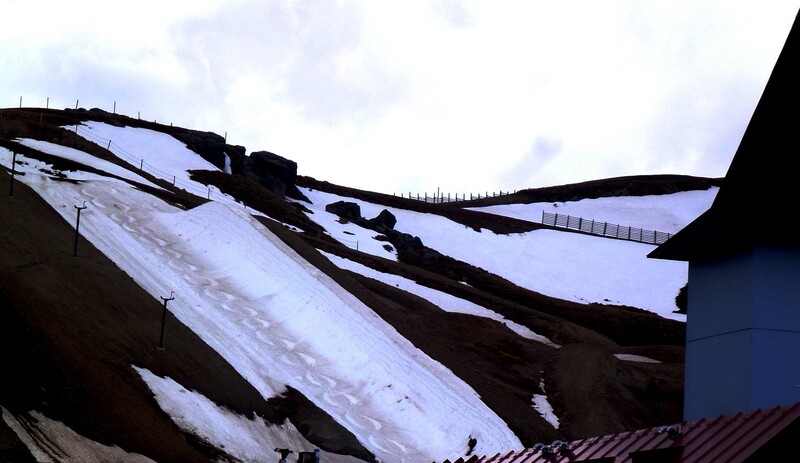 The intention was a day trip up the steep :skijump" route to Corner Peak. 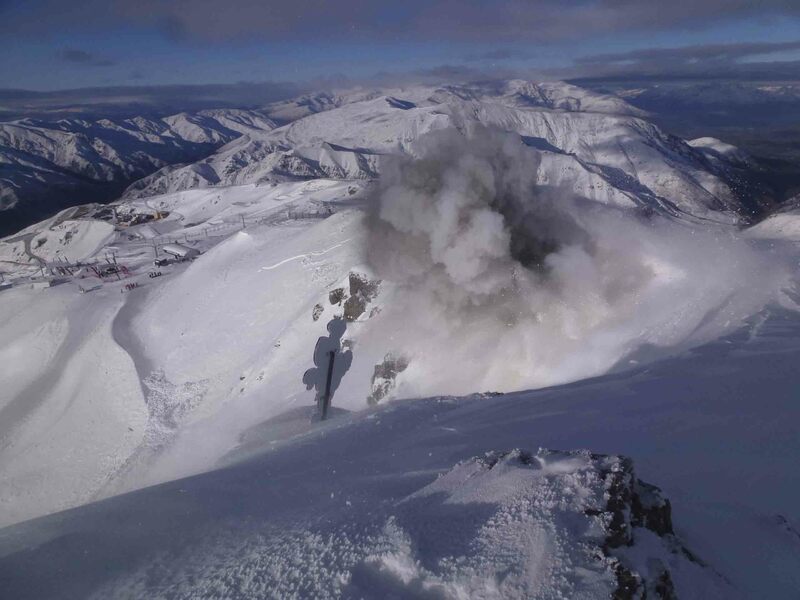 When the alarm was raised by a work colleague the next day Wanaka, Landsar personnel responded by immediately deploying an ACR team due to cold overnight temps and commiting nature of the intended route. The car was located at the base of the climb and a note attached. Two hours were spent flying the access routes and checking access routes before returning to the start for fuel and review to find the vehicle gone. The missing person's vehicle was spotted speeding down the road and heli-chased and stopped. The surprised tramper explained she'd planned the day trip, but carried a sleeping bag. 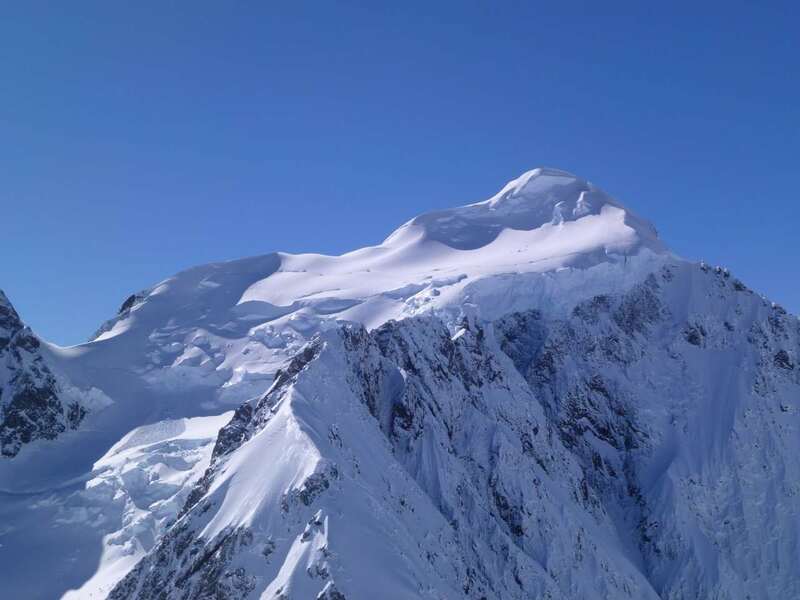 She thought she wasn't due out till Mid-day so when faced with difficulties on the descent slept overnight and re-ascended the ridge back to the ridge-line and followed descent via 1410m peak and poled route to Timaru Creek. The outcome was good, however the confusion over the "panic date" cost 4 volunteers a morning and $5,000 of helicopter time. Solution? Use Adventuresmart Intentions Form. It can be used as a form or emailed to a reliable contact. 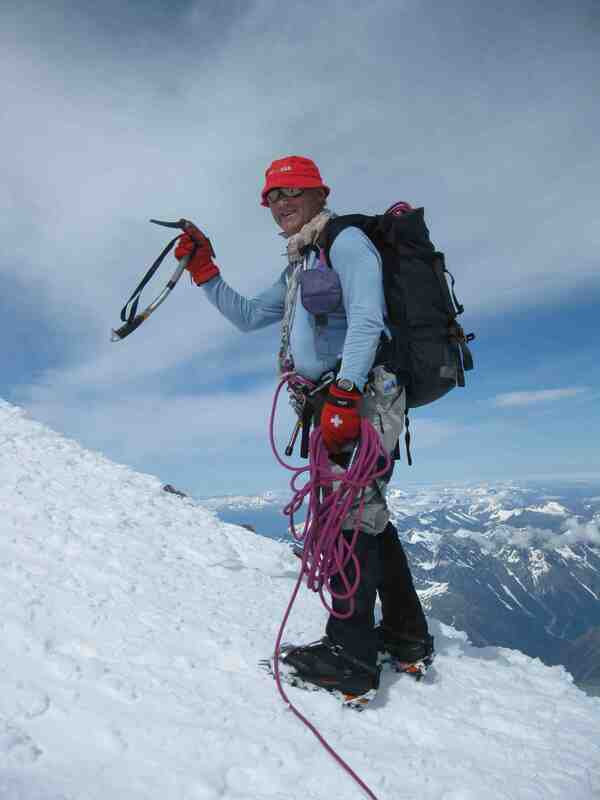 Ruth Hesselyn, 56: Died on 13 March 2012 in a tramping accident when she fell down a cliff in the Nelson region. Previously, Ruth had given herself a 50th birthday present of a climb of Aspiring w/Geoff W. She was a long-time mtn enthusiast and talented cabinetmaker. Lincoln Hall, Aust. 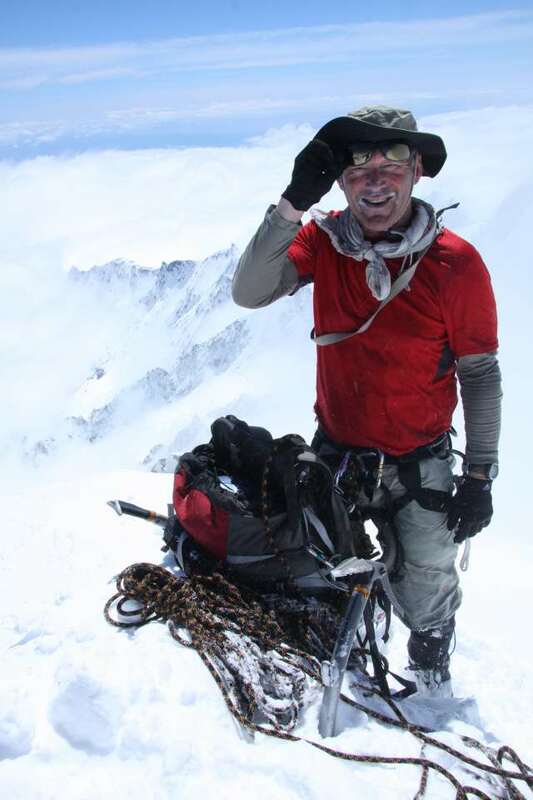 mountaineer, dies, 56. 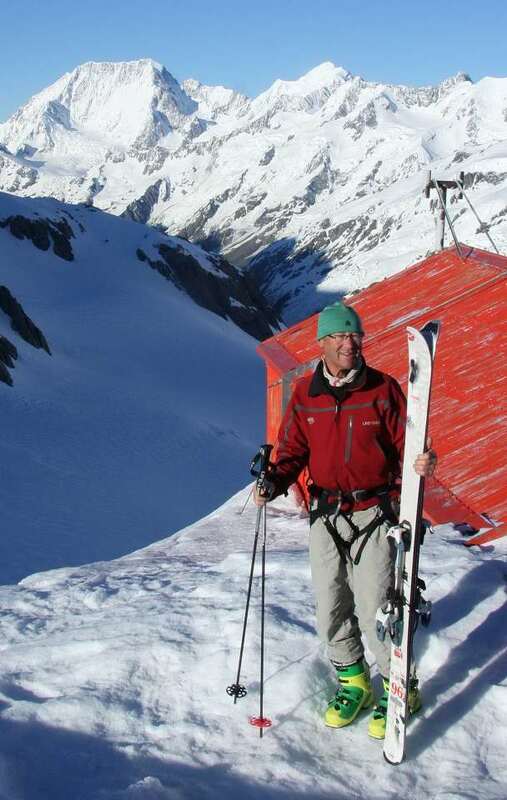 Sad News as Geoff W fondly remembers Lincoln from an Alpine Skills Crse in the late 1970's and has followed his mountaineering and writing career since. 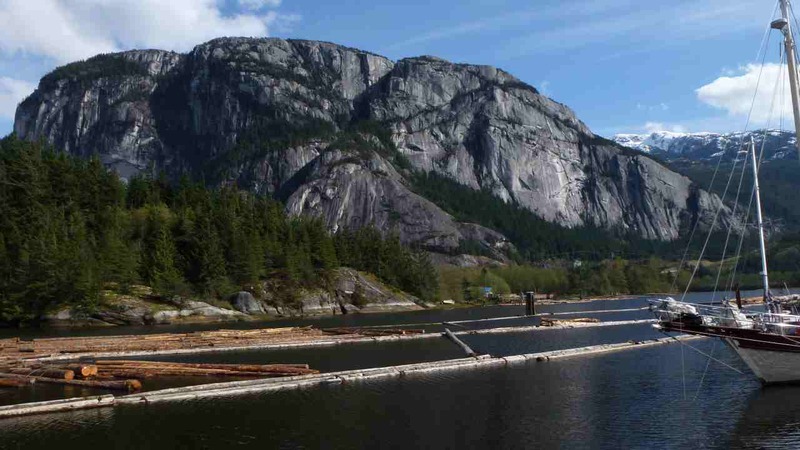 If you have a few spare hours in the Vancouver/Squamish and the day is fine, I strongly recommend a climb up the Chief's backside. 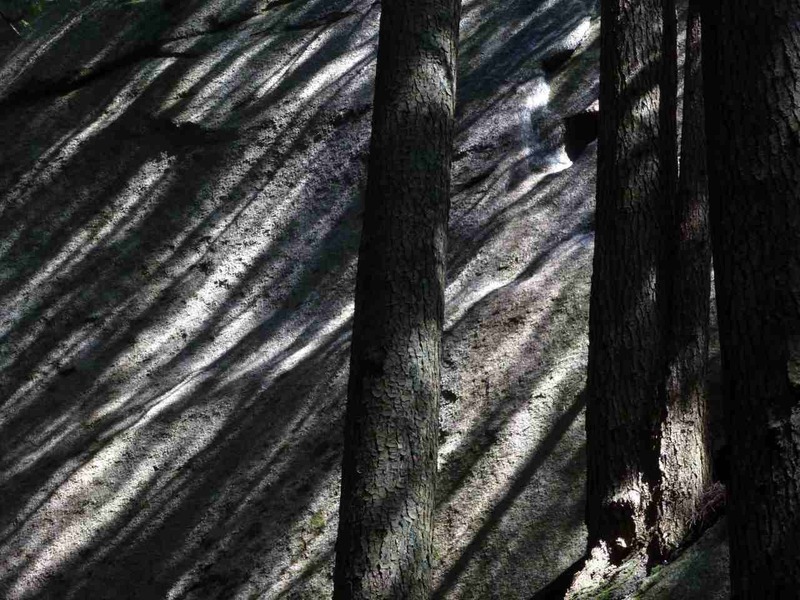 There is a well formed steep staircase climb through forest and boulders to the 1st, 2nd and 3rd peak. 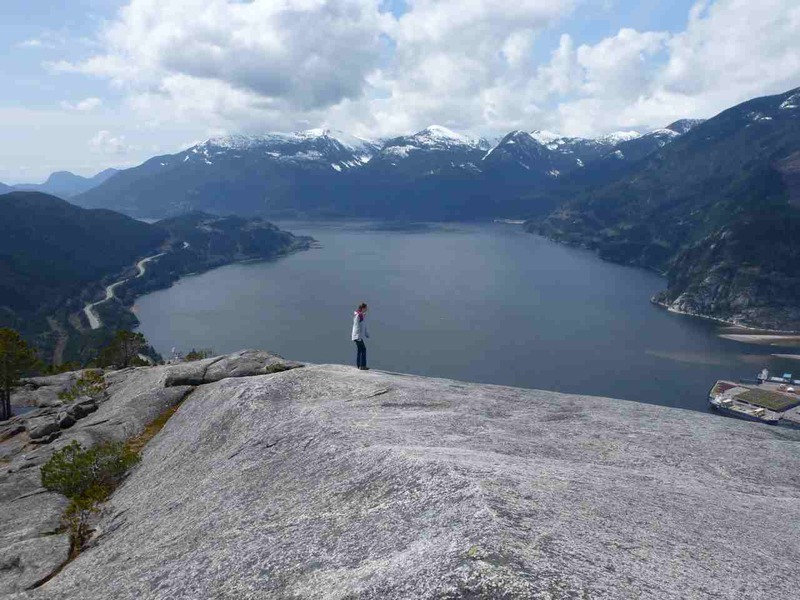 A short exposed rung climb to the 1st peak reveals a vast panarama of Howe Sound. The 2nd & 3rd peaks are great low angled slab climbs with rewarding views. 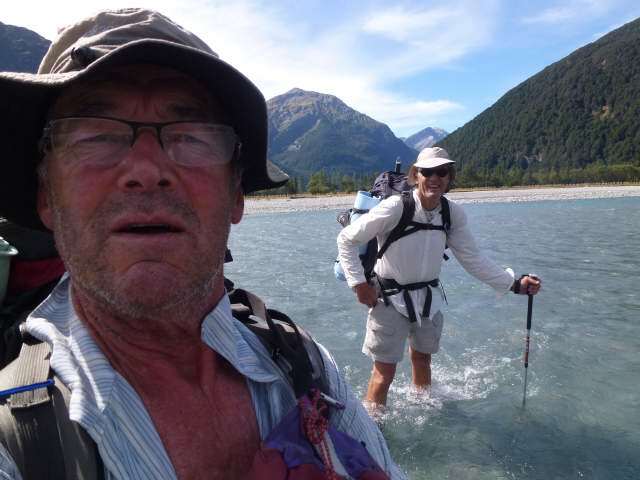 Athol Whimp named as deceased Fiordland climber. New snowfalls in late January extend Summer access. 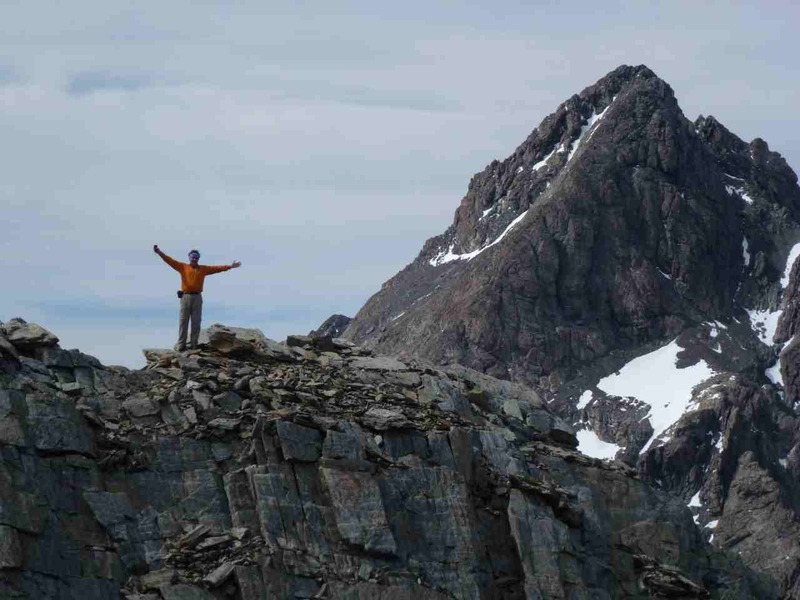 Athol Whimp: The Climbing community will be saddened to hear of the death of 50yr old Athol Whimp yesterday (23Feb) while climbing near Homer Tunnel. 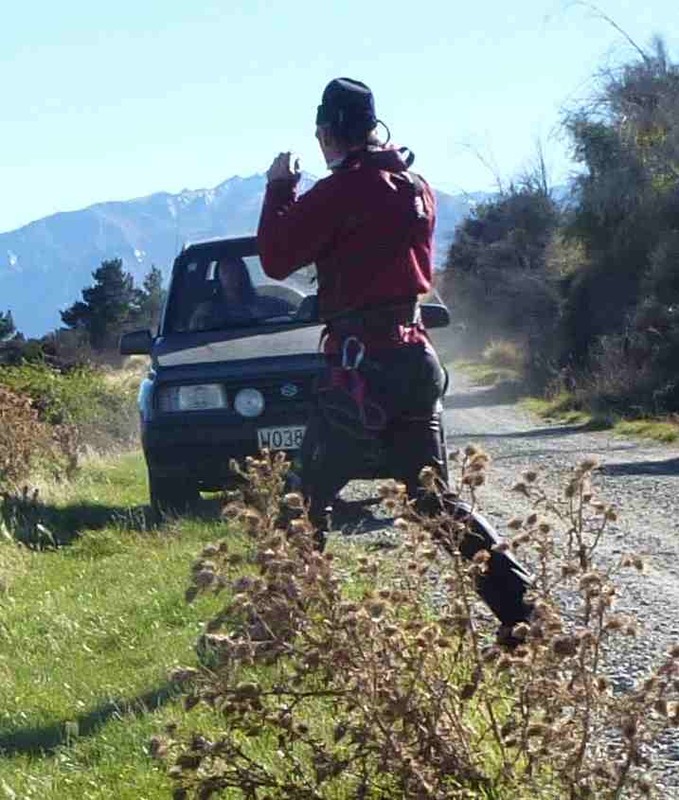 He was with a well known climbing mate, Matt Everard and I believe were in the Homer Saddle area. He fell 800mtrs. His body was recovered today. 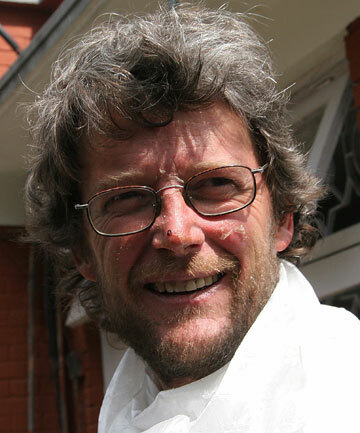 Athol Whimp has been at the fore-front of Australian/New Zealand climbing for more than 2 dacades and particularly excelled on Himalayan Expeditions. 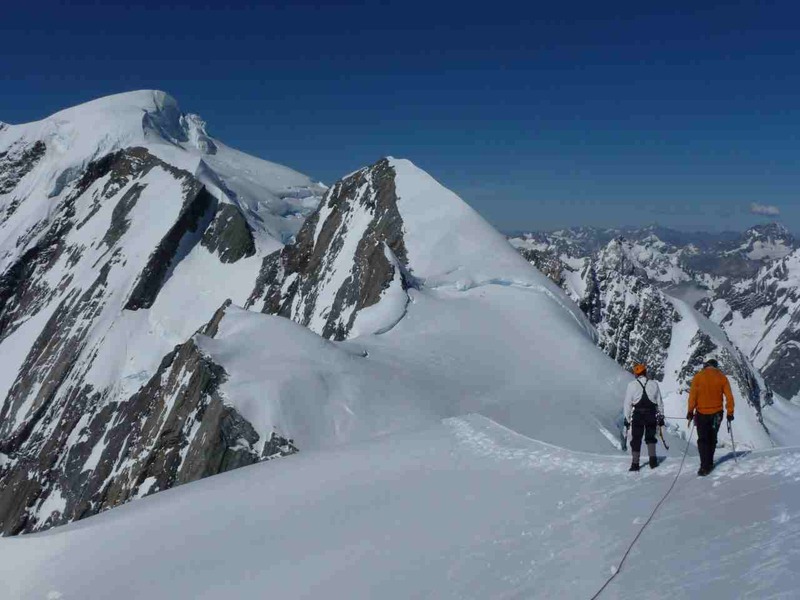 In the late Nineties, Athol Whimp and Andrew Lindblade climbed Thalay Sagar. They were the first to climb directly through the shale band, instead of finishing on one of the ridges. 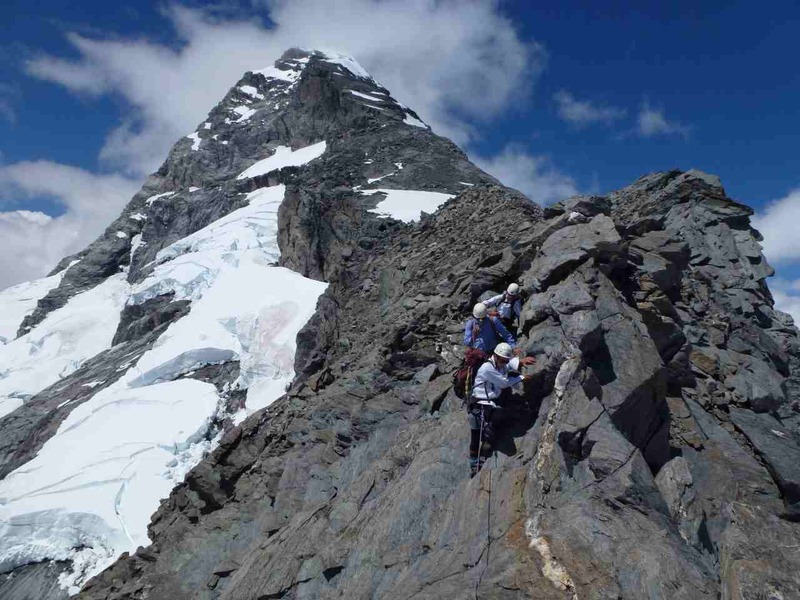 It involved 1,400 m (4,600 ft) of climbing and is graded VII 5.9 WI5. 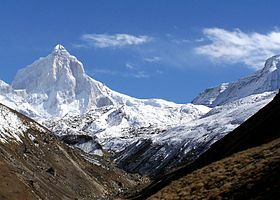 Their climb was awarded the Piolet d'Or in 1999. Good access across the Bonar gl. enabled us to bivi on the mtn and recce the Buttress. Dry conditions enabled my companions to climb to the icecap in running shoes. 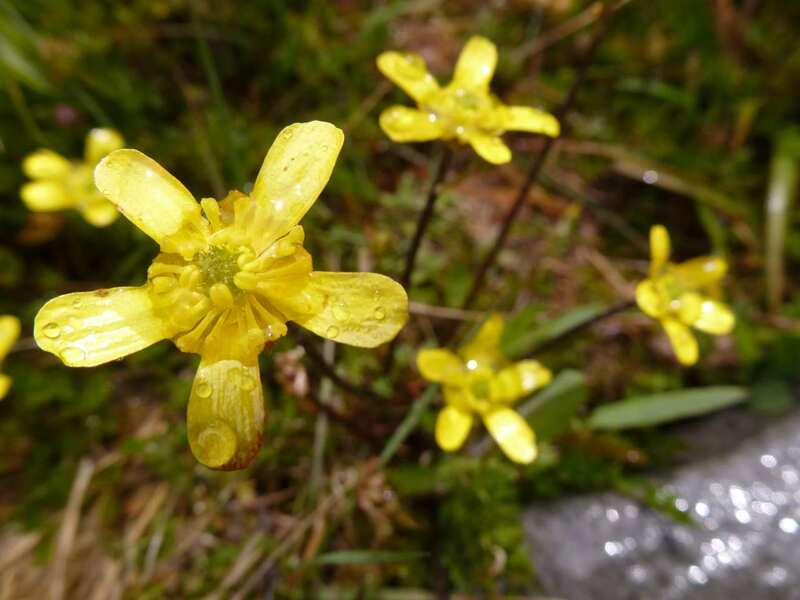 Damp conditions on the Hector col slabs tested our concentration and foretold of a wx change. 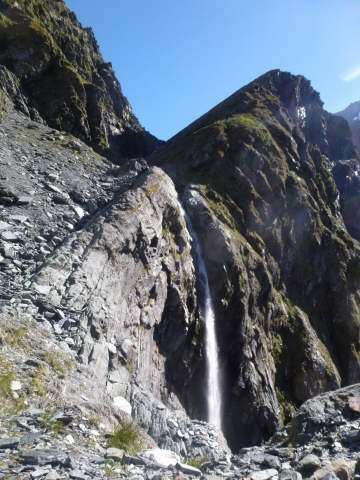 Upper West Matuki valley cirque with dramatic cliffs, water & ice falls. 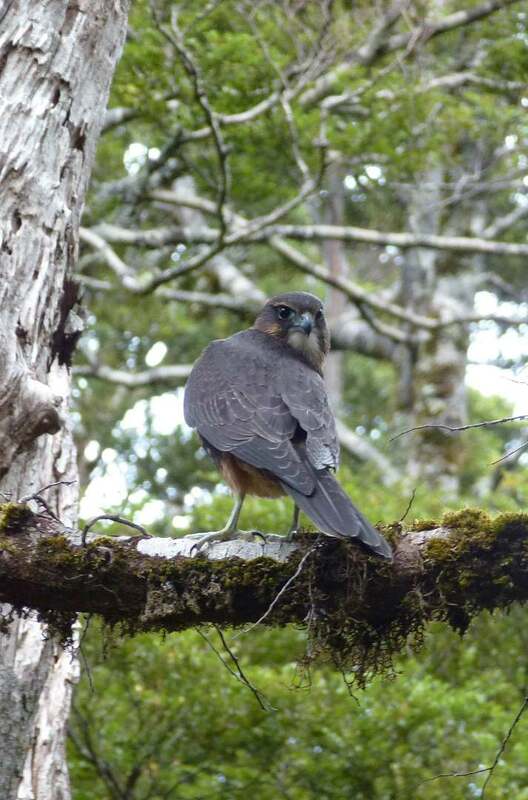 WatchfulShovel Flat NZ falcon eyeballs our group. 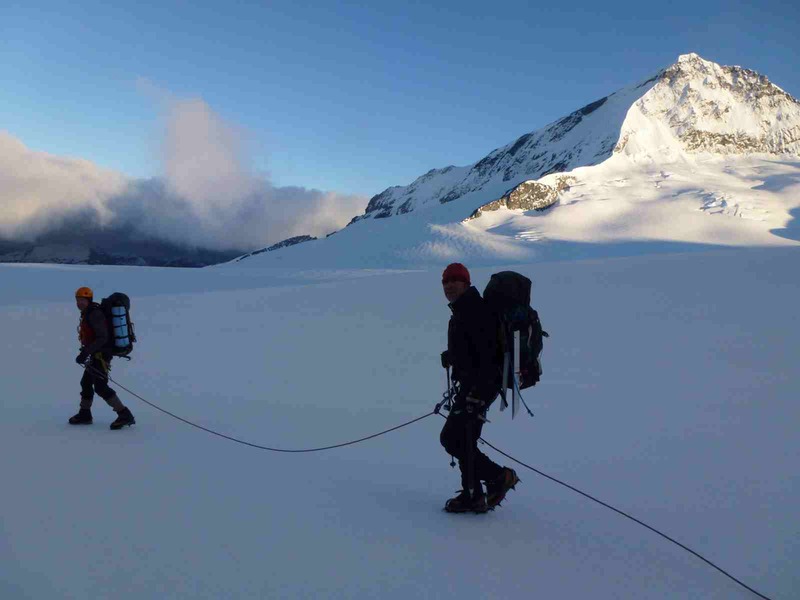 50-100cms of new snow in the alps in late on 21/22 Jan. proved to be good crevasse and ice cover for our climbs in the upper Tasman. A further 2-300mm of precip. 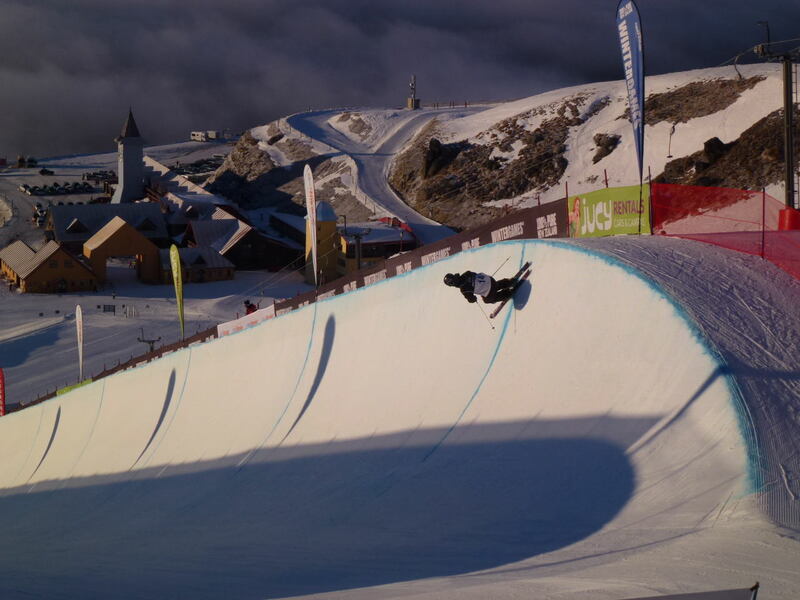 currently falling will further improve snow conditions above 2000m. Mike, Chris and Geoff took advantage of a late jan. 2day fine wx. window to fly into the upper Tasman gl., bivi on Divers Col (2681m) and complete climbs of Green (2837m), Walter(2905m) then back to the glacier (2100m)and across to Hochstetter Dome (2829m). 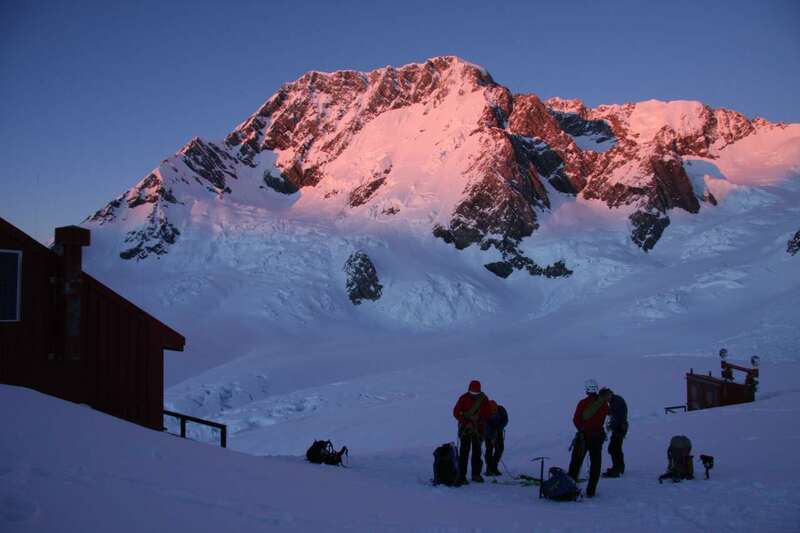 Nov. 2012: Join Geoff W for a 5 day ski tour/climb in the upper Tasman Gl/Franz Josef Glaciers. Dasler Pinnacles w/Mountainrec Jan.2012 -A great 2-3 day Bike/tramp/climb into the Hopkins Valley. 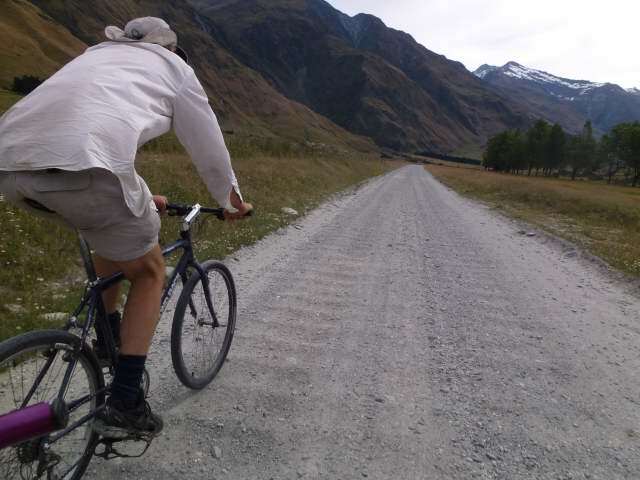 In mid Jan. 2012, Mike and GW left Wanaka driving through to Lake Ohau before riding mtn bikes up the braided Hopkins valley past the Red hut to the Dasler bivi track. After a 1-1/2hr steep climb we arrived at the bushline 2 bunk hut, 6hrs from Wanaka. 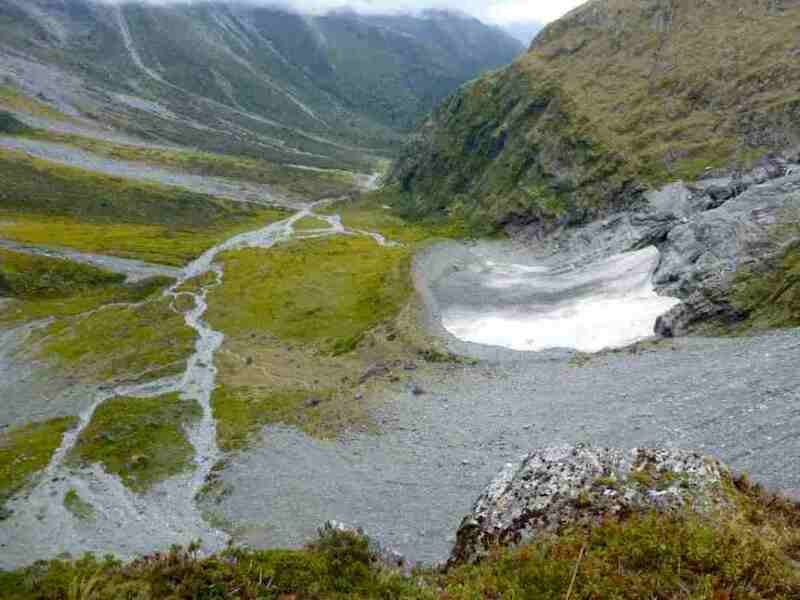 Next morning a long, steep tussock climb led to scree and the Nth. Ridge. A 2hr. steep, exposed rock scramble followed up 300m to the summit. 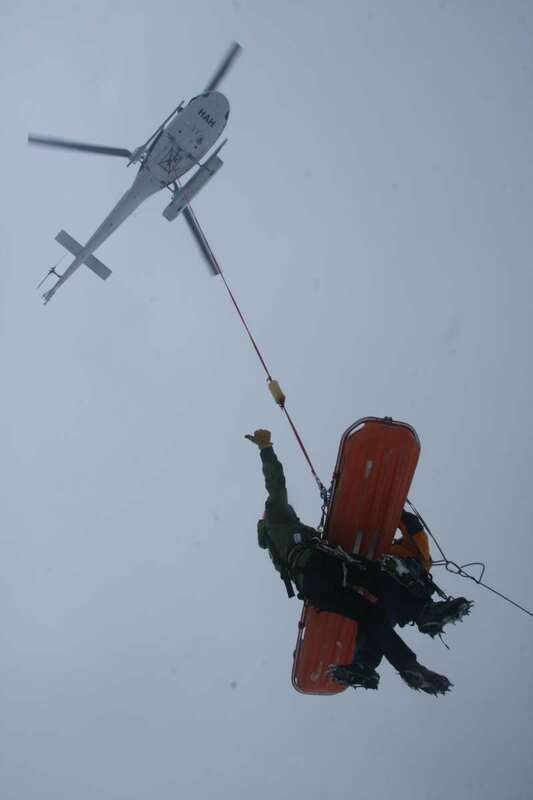 A support rope was carried and used on the descent. Return trip time from hut: 7hrs. After a rest we descended to the valley and biked to the car in 2-1/2hrs. with blazing saddles - no suspension! Summit of Dasler Pinnacle, Mt. Glenmary beyond. 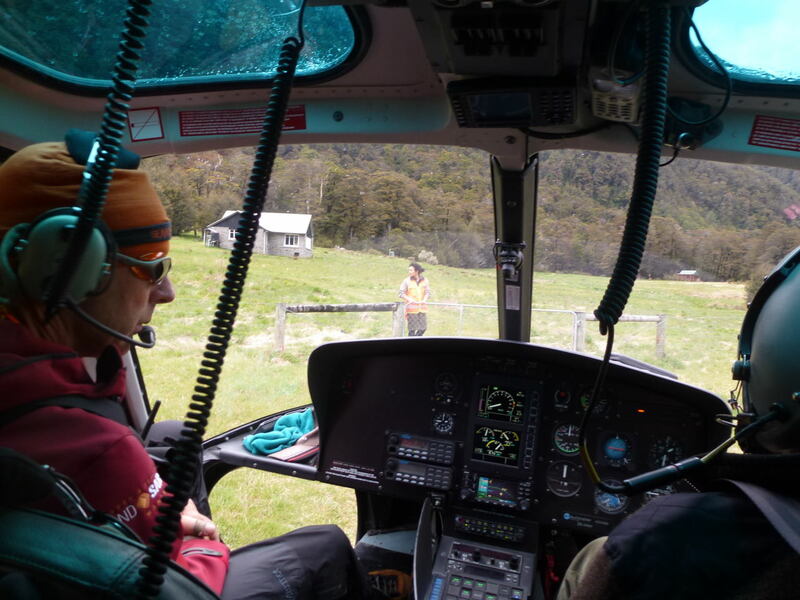 A deceased 60yr old Wellington tramper was located on Mt. Twilight in the Wilkin valley after falling off a bluff while searching alone for a new route. 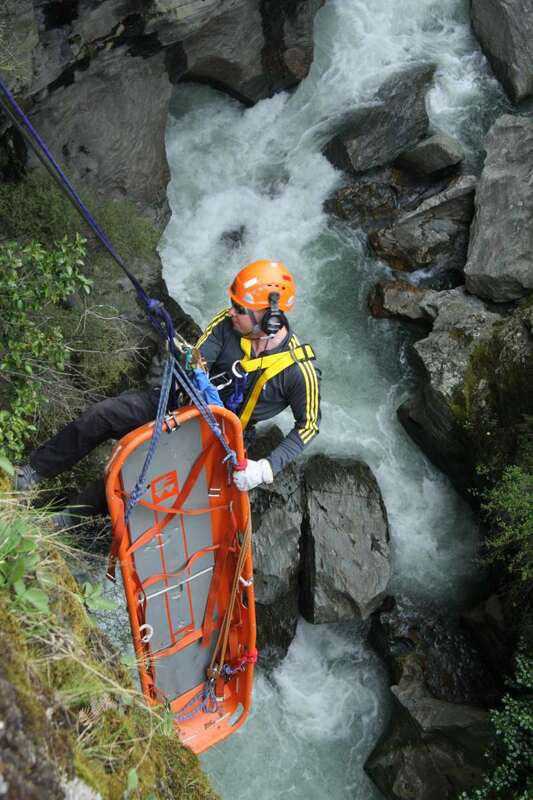 A female was extracted from the Motatapu gorge with a dislocated knee-cap after cliff-jumping into a pool. 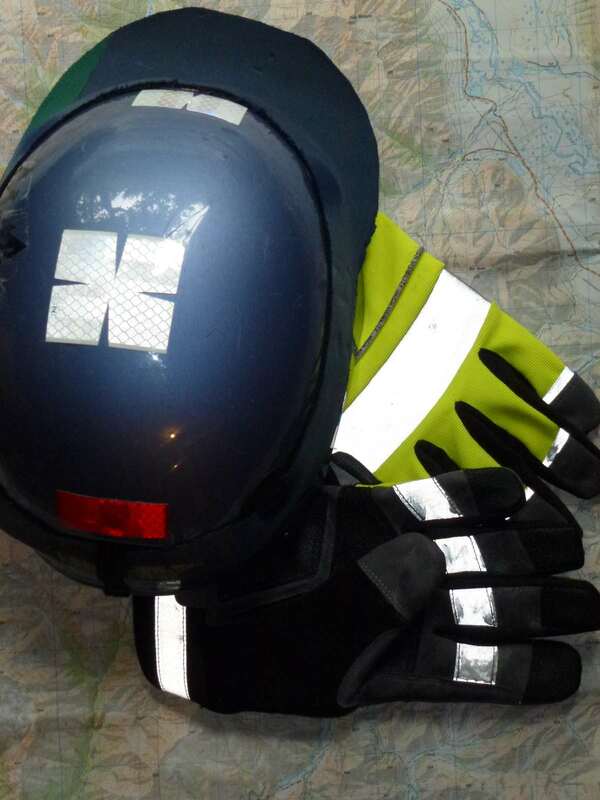 A 15yr old male was extracted from the gorge late NY's day after getting his foot stuck in boulders and suspended upside down in a 2m waterfall for 3hrs until a team of 10 SAR personnel could free him, apply CPR and heli-winch him out of the 45m deep gorge. Sadly he died later in hospital. 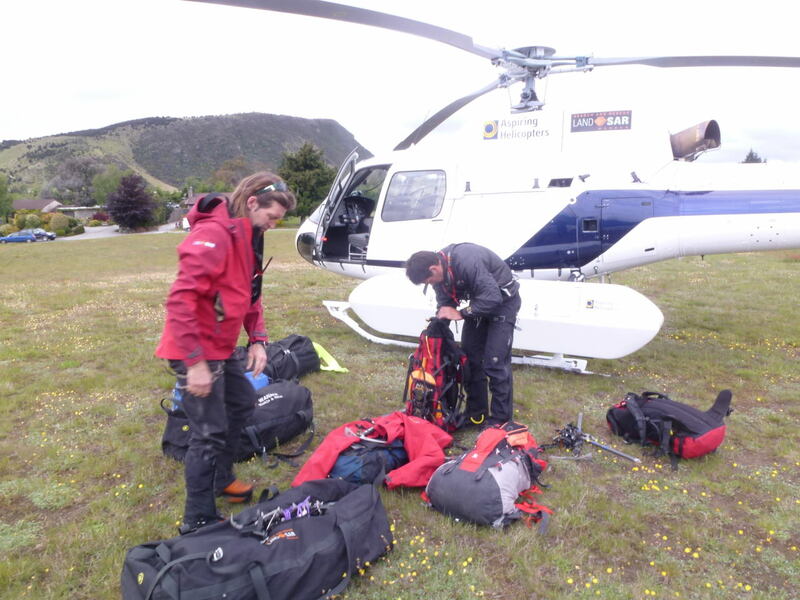 It was one of the biggest and most urgent SAR Ops conducted by Wanaka SAR volunteers. 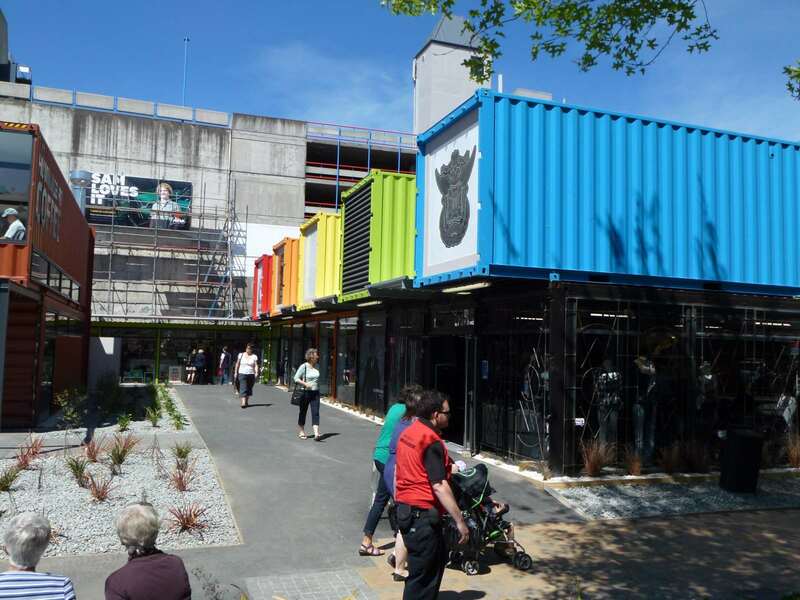 31 Dec - Old "Bucky" continues to disturb Christchurch Residents with new Quakes and fore-warns of a long recovery period. W. Face, Minarets & de la Beche Minarets & Aoraki & Tas. Gl. 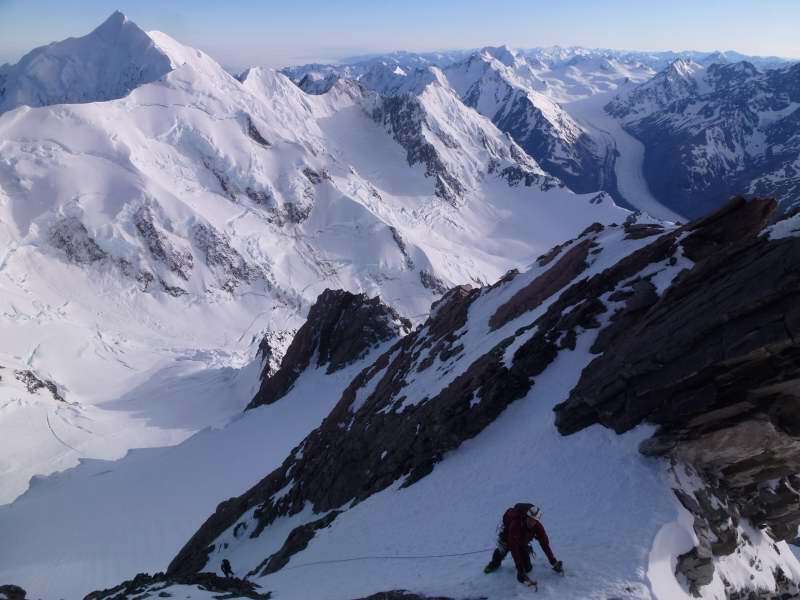 The steep west face provides straight forward early season access onto the visually central Minarets involving 4-5 pitches of steep ice. Aspiring or Aoelus? Which did Surveyor Thompson name? Geoff climbed the SW ridge on 30/11 with two long-time clients, coaching them up easier pitches and leading a few of the more serious ones. 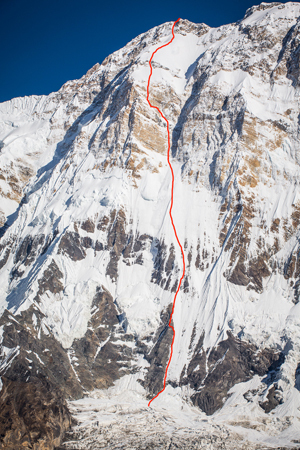 The 14 pitch climb took 6hrs incl. 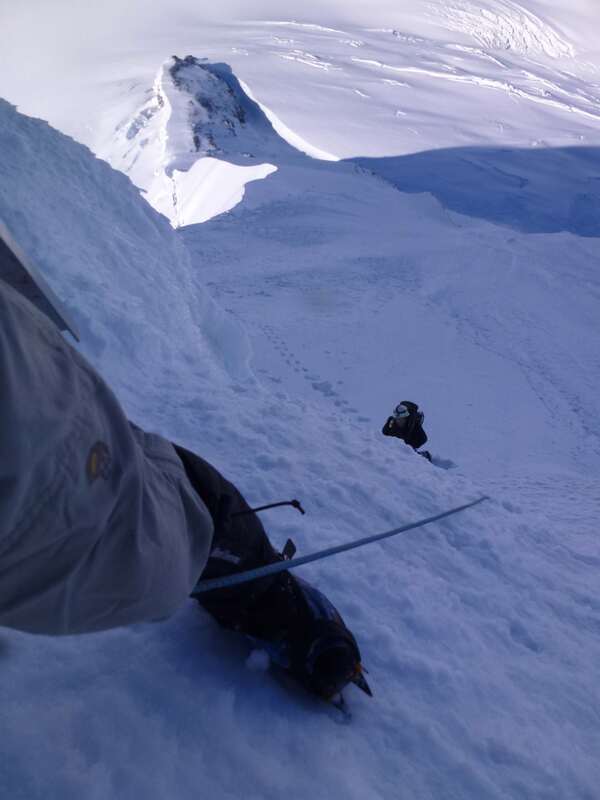 1 steep waterfall ice pitch and 4 in the final couloir to the summit. The ascent used a rare 2-1/2 day fine weather window and involved two cold but spectacular bivis on Mt. French. 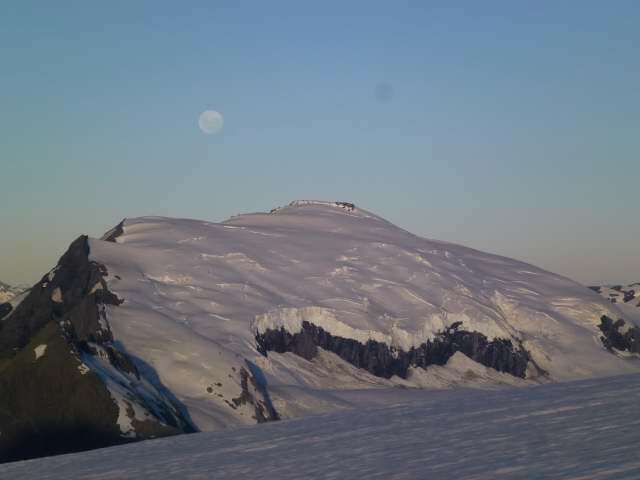 2011/12 Bonar Glacier Snow Cover: The low snowfall winter with strong SW winds is currently apparent on the glaciers and mtns of the Aspiring region. Expect firmer snow and more difficult access conditions from mid January onwards. Escape from windy bivi Chris M clinging to the"SW Edge"
A special opportunity to visit a high and remote location requiring strong mtn. fitness, but no specific alpine skills. 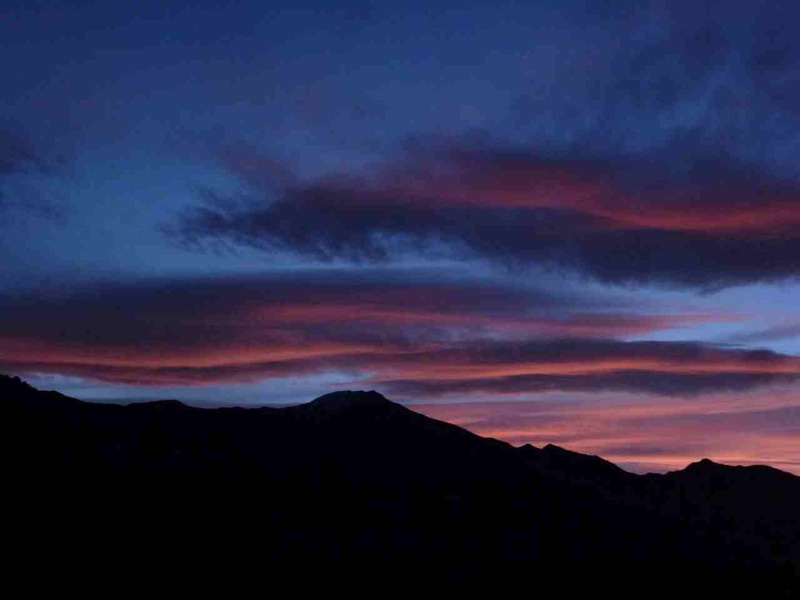 It is a chance to photo spectacular alpine & Aoraki/Mt. Cook & Sefton sunsets. MAIN DIVIDE TO THE SEA - "Just a taste of mountaineering"
Crampon Straps: Modifying crampon bail straps for added security. 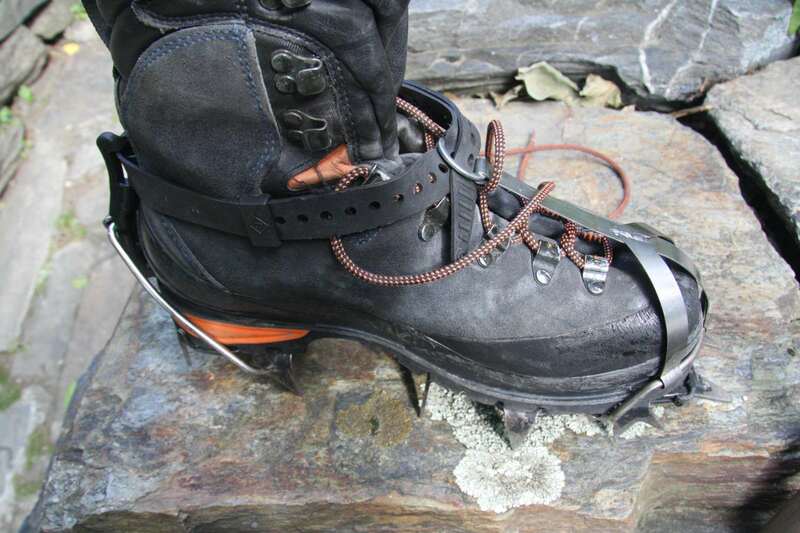 Crampon security to the boot is a vital component to ice and snow climbing safety and many climbers have stories of detaching crampons from a variety of attachments. 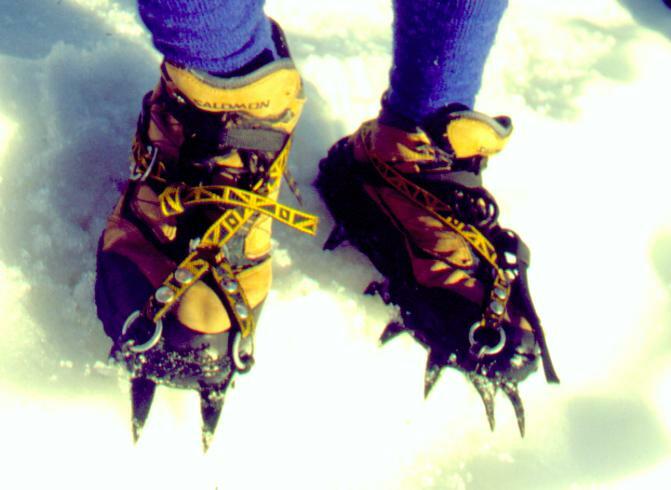 The security of "toe bail" type crampons has has recently come to my attention following two fatal accidents. The climbers involved happened to have "toe bail" crampon attachments w/o an added stainless steel strap linking the toe bail to the ankle safety strap. 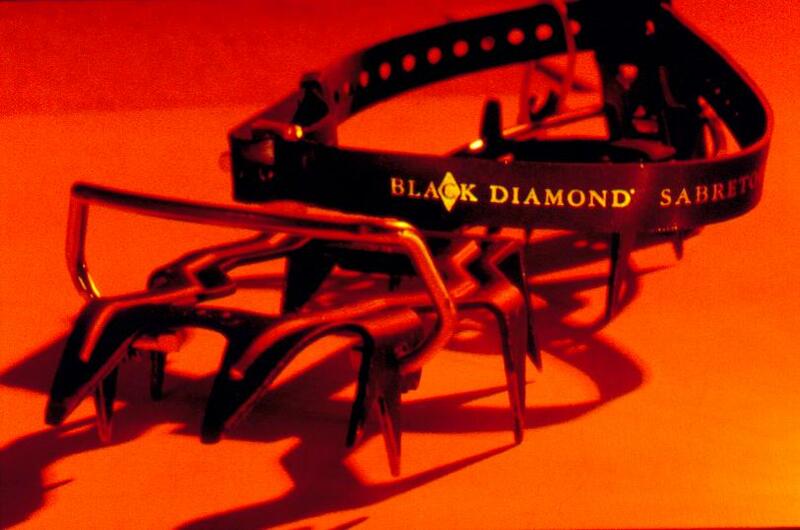 If the bail was to become detached then the crampon would hang loosely on the safety strap. A steel strap adds some stability to the attachment. 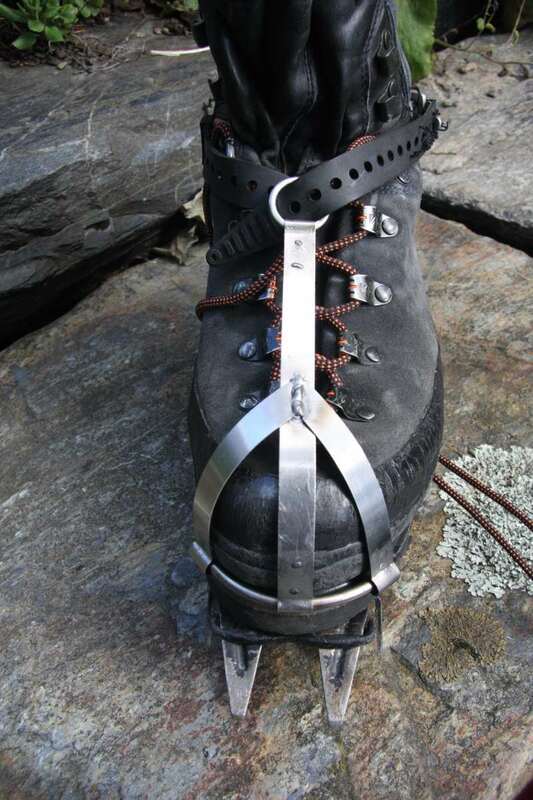 I have added steel straps to some bailed crampons along with additional diagonal straps to add stability. The exercise was not cheap ($180) but neither is the experience of discovering a crampon dangling from the ankle strap. GW's helmet and gloves reflector tape. The latest NVG (night vision goggle) and powerful helicopter searchlight technology means missing persons can be found by highlighting reflector tape. NVG's have 6,000 times illumination and see a lighted match from several kilometres away. More importantly, a search team can locate a missing person without their imput if their clothing has reflector tape on it. Combined with PLB's GPS's and even your Camera? I don't know what use it's gps would be, but people have been located by their camera flash. I carry a Lumen light stick as well. 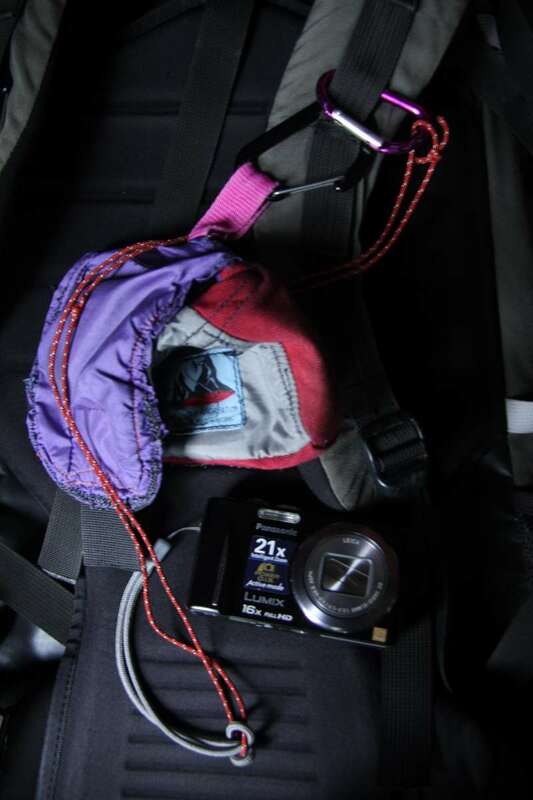 I carry my climbing camera clipped onto my pack strap in a GW-made soft case w/ spare battery in lid. It is secured by a parachute cord leash to the bag. 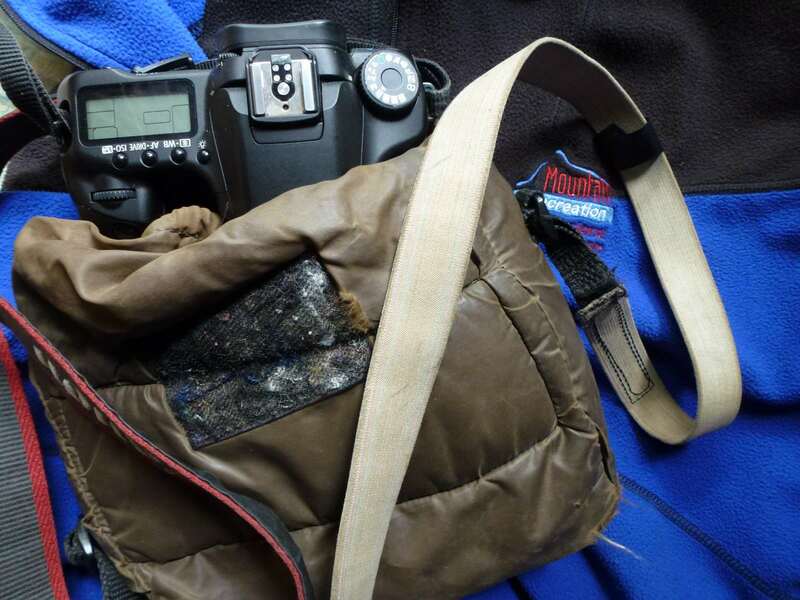 A backup cord also attaches the bag and packstrap incase the karabiner opens. Ed Hillary dies at the grand age of 88. Summer meltdown continues on glaciers. NIWA reports glacial volume loss. 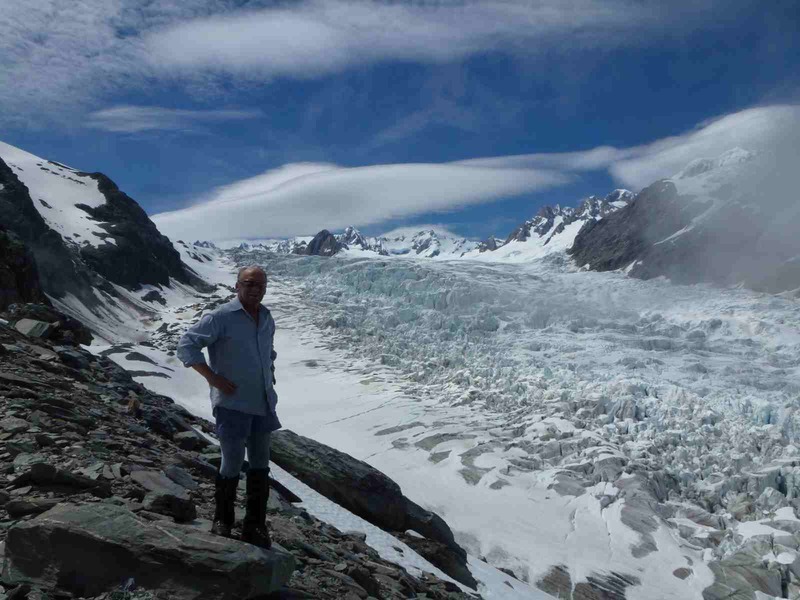 including latest photos of our 4 day Fox Glacier Exp. Photos: Mt. French Expedition. New! 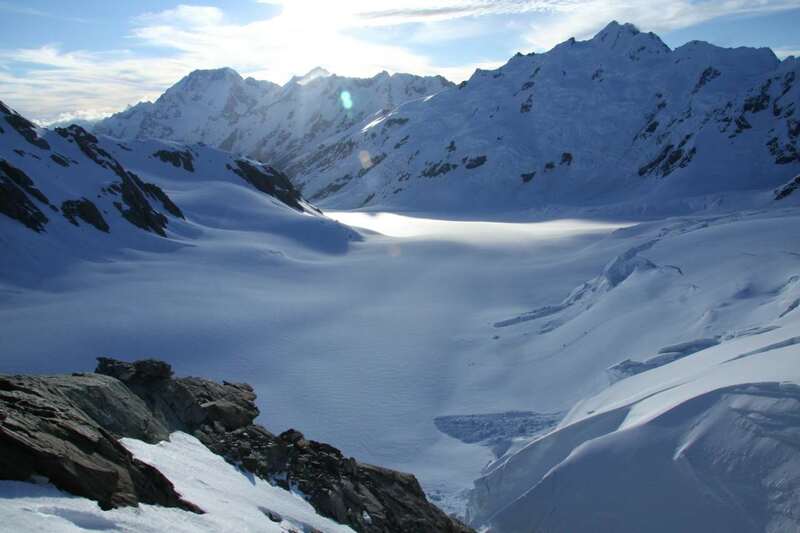 Glacier shrinkage reported: Most of New Zealand's glaciers are now the smallest they have been since records began - and they continue to shrink at a rapid rate.